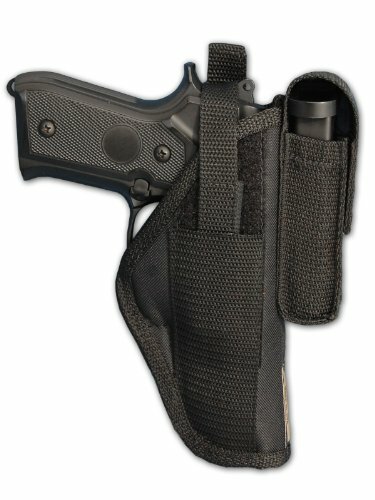 List of holsters for specific makes and models of guns. Which holsters are good fits for the SIG P226? We list 10 awesome options below that should fit your SIG P226 well. We also look at 5 of them in finer detail to figure out how well made they are, do they offer good value for money and how comfortable are they. The gun for which you are buying the sheath is the biggest factor in your ultimate decision. So let us have a close look at the SIG P226 as a pistol in terms of its size and how it might be used. The SIG P226 is a medium to large size gun. This relegates pocket and ankle options, as it would be incredibly difficult to conceal. The best products for these weapons would be regular over the waistband (OWB), inside the waistband (IWB), or shoulder selections. We listed 10 options for the SIG P226 in the comparison table above. Below we are going to take a closer look at the 5 options that we really like and think would be good SIG P226 holster options. We look at factors such as overall quality, comfort, affordability and how well it fits the SIG P226. If you want a really comfortable case that you can carry concealed with, then this one might be the answer! It has a two two-pieceign whereby the side of it that come against your body contours to your hip, while the molded piece is on the other side. This results in a nice narrow product that lends itself to concealability. Some folks mentioned specifically how comfortable this one is to drive with (don’t you just hate it when a sheath is poking into you when you are in the car?!). One design feature that does make it less ideal for concealed carry is the fact that this product rides a little low. So you might need to wear a longer shirt or jacket to properly conceal your weapon. From a retention perspective, this option is great due to it being hand molded for the SIG P226. Draw is nice and quick thanks to the combat grip. Folks rave about the leather selection with double-stitched seems. If you want a solid product that should last you a long time, this is a really good option for you to consider. Of course, leather holsters like this does need a bit more love and care, and you will need to break it in a bit when you first get it. You can order it to your liking, as it comes in left hand and right hand options. It is available in Havana brown or black. This SIG P226 holster is famous for it’s active retention system. It does away with thumb breaks which can make re-holstering difficult and slows down your draw. Instead, it has a SERPA Technology lock which, when you contain the weapon, automatically engages the trigger guard and will hang onto it until you release it. You release it by simply using your normal drawing motion and using the trigger finger to push the mechanism beside the body of it as you draw. Your trigger finger should naturally fall on the lock release mechanism. However, some users have reported that the thumb push off area is a little on the small side and you need to wiggle the gun to release it from the sheath, just like a new leather product, and that it actually follows the gun upwards as you draw. Also, it is a little bulky, so may not ideal for concealed carry. It comes with both the paddle platform and belt loop, and there are swivel buckles on the belt loop, which allow articulation for maximum flexibility. A few users have noted that, with the belt loops, it is difficult to attach and remove a duty belt. All in all, a good, solid SIG P226 holster. 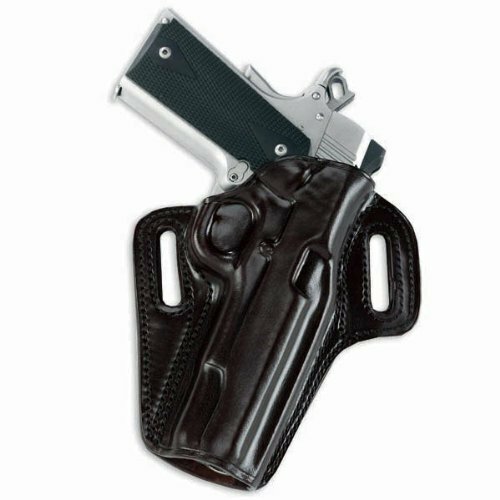 This SIG P226 holster is made from premium ballistic nylon and is ambidextrous. It also has a powder coated black spring clip (for left handers, it can be removed and inserted on the opposite side) which will hold this product securely on your belt. It comes with an extra magazine clip. This SIG P226 holster is an inside the pants container. Some users have mentioned that this product does sit a little low on the waist band, making it difficult to conceal with some garments. A good upgrade would be a version that sits just a little higher which would give you a better draw grip. Some users have also said that it had a rather long break in period with the P226 pistol. One user said it took over a month for him to be able to pull out his P226 without pulling the entire holster out. The star is the black spring clip, which many users say is solid and holds it very securely on the belt, even if it may be a little stiff when swapping the clip from side to side. Almost identical to the Galco Concealable Belt case above, this SIG P226 holster is different only in that it is a high ride belt container. Available in tan or black premium leather that Galco is famous for, it can be very stiff in the beginning and your pistol will feel tight when inserting and drawing. One user recommends that you draw you weapon a few dozen times a day until you get a smooth draw. Also, you may want to break it in by drawing when sat down as well as when stood up; even if you’ve managed to get your draw smooth when stood up, you may find your pistol still sticks when drawing sat down. But like all high quality leather goods, it only gets better with age. The effort is well worth it as you are training it to fit to the exact form of your gun. You may also want to try the Galco recommended Draw-EZ solution to further break in your case. This product is ideal for belts up to 1 and 3/4 inch belts. Because of the higher ride, this is more concealable and comfortable, with only a long vest or shirt needed to cover. Also, this SIG P226 holster has good retention, even without the thumb break. This SIG P226 holster is a traditional vertical shoulder option from Galco, which has been field tested over military uniform as well as hunting clothing. This is ideal for anyone who prefers the classic vertical carry style (vertical position is ideal for concealed carry as nothing sticks out). This system has many fans who claim it gives the perfect fit due to it’s spider harness. All four points of the harness are connected by the clover-shaped swivel back plate and can pivot independently of each other. Add to that the swivel connectors, and this system can fit virtually any body size comfortably. Many users have used cheaper nylon holsters and would now never use anything but Galco’s premium leather. The full system comprises of SIG P226 holster, harness, ammo carrier and a set of system screws. It is ambidextrous and available in tan or black finish. As with all premium leather goods, there is a break in period required before you can contain and draw smoothly. Ok great, so we had a nice detailed look at 5 options that are a good choice for your SIG P226. But how do they compare each other? Let us quickly recap each one and see how they stack up against each other. If you want a solid leather product that fits your SIG P226 like a glove, then have a long hard look at the Galco Concealable Belt product. 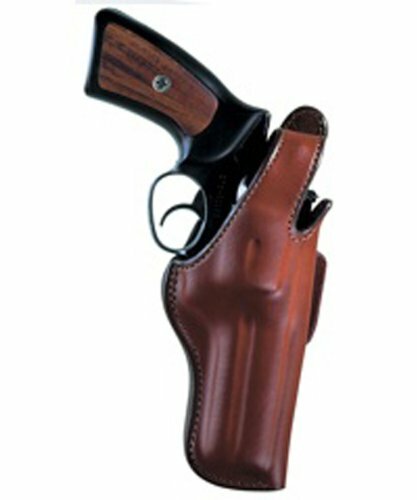 It is made from quality saddle leather and is hand molded for the SIG P226. It is a bit more work to look after a container like this, but it is also one that will give you years of joy if you take good care of it. Due to its narrow design, concealability is good for this product, although it does ride a little low. The BlackHawk product is made from carbon fiber and also a good fit for the SIG P226. Although comfortable to wear, because of the SERPA technology lock, many users find that it is drawn up when wanting to remove the gun. Also, this lock means that users need to ‘wiggle’ the gun to release it from it, not ideal for a quick and smooth draw. The DeSantis Pro Stealth option is made from premium ballistic nylon and another good fit for the SIG P226. It sits rather low, so can be difficult to conceal, but is comfortable when worn. The main drawback with this SIG P226 holster option is the long break-in period when it comes to the product releasing the gun smoothly. It may be a while before you achieve a smooth and fast draw. The Galco Fletch High Ride Belt is almost identical to the Galco Concealable Belt with the only difference being that it ‘rides high’. This makes it more concealable than the first Galco on this list. The Galco Vertical Shoulder System is a premium leather shoulder product. It is a perfect fit for the SIG P226. Because it carries the gun vertically, it is fantastic for concealed carry, although, of course a jacket or coat is needed. When it come comes to comfort, this SIG P226 holster option is unbeatable due to it’s design. And draw is also fast and smooth, so long as you factor in the break-in period required for all leather products. Which SIG P226 holster would we choose? It’s easy to see why we would pick a Galco product here! Three out of the top five SIG P226 holster options are made by Galco. The beautiful, premium leather, the perfect fit for the SIG P226, and how comfortable these goods are to wear, have made them a favourite for everyone. Take your pick from the Galco´s depending on what kind of carry you prefer. The SIG-P226 is a rather large gun, so complete concealment is difficult. If you desire concealed carry, then the Galco Vertical Shoulder System, with it’s vertical carry, ensures your gun remains hidden. The pay off here is that you will need to conceal the whole system using a jacket. 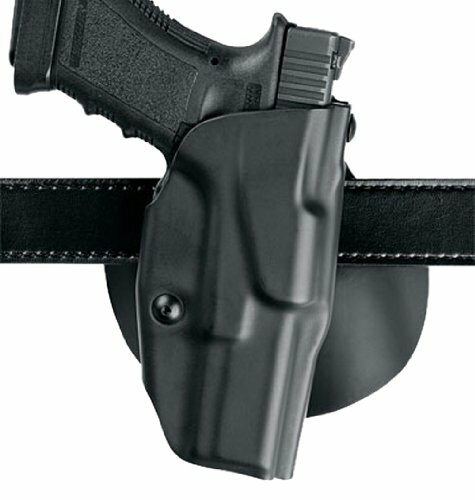 The Galco Concealable Belt is ideal for those who prefer one that rides a little low. And the Galco Fletch High Ride Belt, as the name suggests, is perfect for those who likes cases that ride high. Just remember to factor in the break-in period required for these ones, as the leather does need to ‘give’ a little before your gun can be drawn smoothly. WHAT DO YOU THINK – WHAT IS THE BEST SIG P226 HOLSTER OPTION? Life is full of choices. And it seems when it comes to SIG P226 holster, that holds true. Which option is the best choice for you, really depends on your own needs as well as your budget. But we hope that we were able to possibly point you in the direction of some products that might be the right choice for you. The SR9c can be defined as a small to medium sized pistol. Therefore it is much easier to conceal and can be used in conjunction with a whole host of Ruger SR9c holsters, from pocket, ankle and shoulder options, over the waistband (OWB) selections, and inside the waistband (IWB). Below we look at 5 Ruger SR9c holster options that are available on Amazon. We look at the materials that the products are made from, the comfort of how it is worn, how it fits the Ruger SR9c, and how easy it is to draw your weapon from the sheath. This Ruger SR9c holster is made from injection molding and space age plastics, and is a right handed, OWB paddle. Retention of the SR9c is good, and there is just enough friction to hold your gun without it moving around. It rides high on the waistband, and is therefore very easy to conceal. A good design feature is that, as the paddle sit deep inside the pants and has an indentation to hold the paddle to your belt, it will not pull out when drawing your gun. Some concerns are that it can be difficult to draw your SR9c from this product; users have mentioned they need both hands to release the gun, not ideal in emergencies. Other users have also found that, although at first it may see like the perfect fit for the SR9c, this one can leave scratches on the muzzle, and therefore maybe just a little too small for the Ruger SR9c. Concerns have been raised about the quality too, as this Ruger SR9c holster is molded as two pieces which are then tacked together in only a few spots, leaving gaps in the seam (mainly along the bottom of the barrel and trigger housing, as well as along the slide on the top. 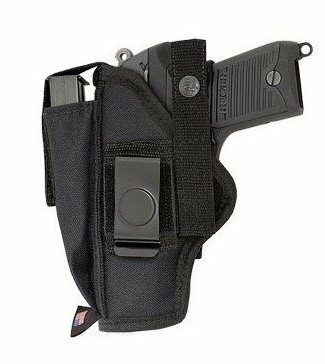 The outside of this pocket Ruger SR9c holster is made from a black, viscous, nylon cloth which is like fly paper. It will not budge from your pocket, The inside lining is made from a slick cloth that gives next to no friction, making it ideal for quick draw. The core also has foam to break up the outline of the gun, aiding concealment. Although this Ruger SR9c holster functions well and fits the SR9c well, many users say the foam at the core is not strong enough to conceal the gun’s outline and shape. Some users have even said it actually emphasizes the shape of the gun. An ideal product for storage, or if you wear a long jacket most times that cover your trouser pockets. But not so good for concealment when not wearing a jacket. 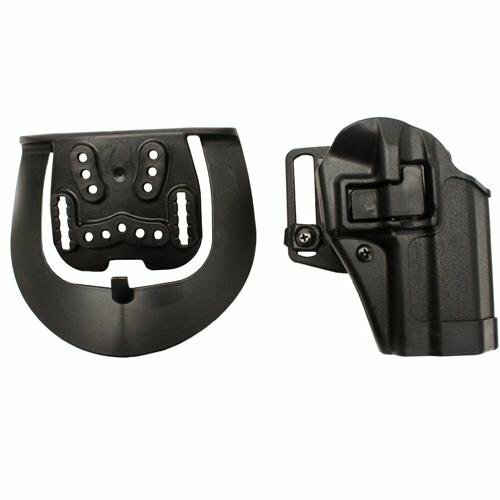 This outside of the waistband Ruger SR9c holster is made from 600 denier nylon, and boasts a fully adjustable thumb break which keeps the weapon secure as well as eliminating delay when drawing your weapon. It also has a webbed spine, which ensures that this option will bend into a customized fit for each user. 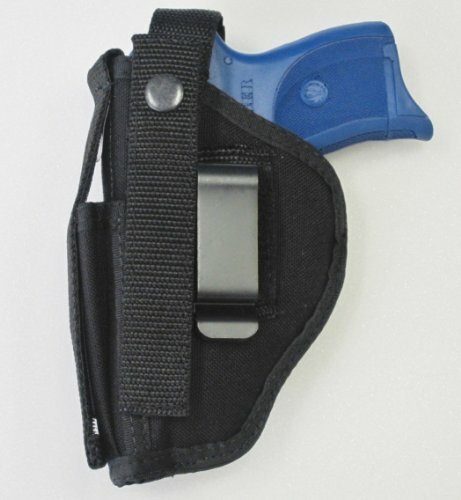 It comes with a handy magazine pouch, and also has a removable steel belt clip which allows the Ruger SR9c holster to be mounted to a waistband or belt. Lastly, a belt loop is provided for a more permanent and secure mount to a belt. It is a good fit for the Ruger SR9c, and the velcro retention straps can be adjusted for length and angle for a personal fit. You can also position the strap over the grip or the hammer / striker, as well as move the thumb snap from the side to the top. There are some concerns regarding craftsmanship, with some users mentioning that there were loose threads on the piece that holds the belt clip on. The belt clip itself causes concerns as it is not very functional, with some users having to thread it on by taking their belt off. Also, the metal clip seems to dig into your skin, causing pain. This can all be avoided by using the belt loop instead of the clip. Furthermore, the thumb snap can start to feel loose after repeated use, so there are issues regarding the longevity of this Ruger SR9c holster. This Ruger SR9c holster is an IWB product made from heavy duty, grade A leather which boasts great craftsmanship with double stitches at stress points. 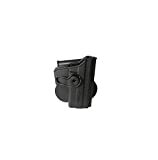 This product is designed as a Ruger SR9c holster, so, in terms of fit, is perfect. As with all leather goods, there is a ‘break in’ period required, so the gun may feel tight at first, but the manufacturers give you suggested methods to help break your sheath in quickly and easily. Only real concern is that it can be a little on the bulky side, and some users found it difficult to conceal. 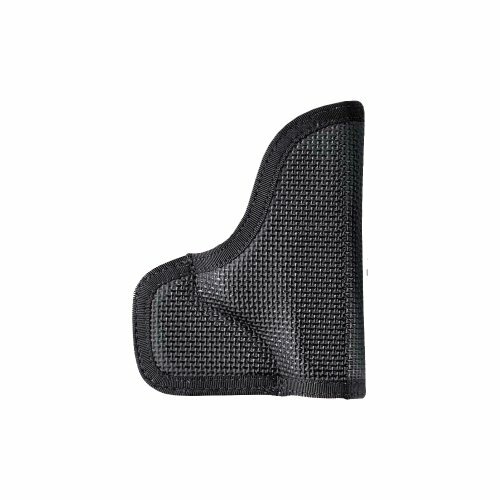 It also does not disperse the weight of the firearm, so if you plan on wearing this Ruger SR9c holster for 6 hours plus, you may find it rubs on the upper thigh. Another IWB made specifically as a Ruger SR9c holster, this is made from a hybrid of high-density leather and Kydex, a thermoplastic material. As you would expect from a product designed specifically for a make and model of gun, this is a perfect fit, and with it’s ‘comfort curve’ features, ensures that it is also a perfect fit for your body too. The Kydex is at the back of the Ruger SR9c holster, and it curves against the user’s body, creating a very individual, snug fit, that means this is very comfortable to wear, and conceals your gun better, as it brings the grip closer to your body. 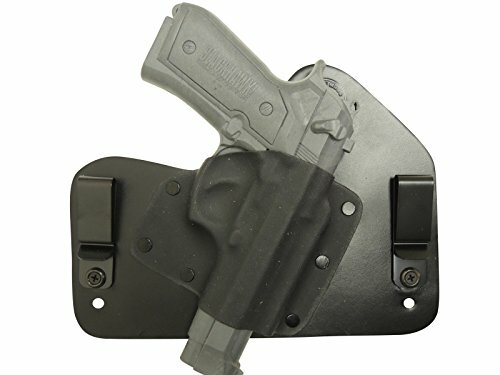 The sweat guard cut allows the user to have a full shooting grip when the gun is holstered. This allows for a very fast draw. Other features are that users can adjust the retention, so you can get the right amount of grip the product has on the gun. This means no issues with gun falling out unexpectedly, or being so tight that a user finds it difficult to draw smoothly. Many users have praised the craftsmanship, with the durable Kevlar stitching, beveled edges, and the ability to adjust carry height and cant. 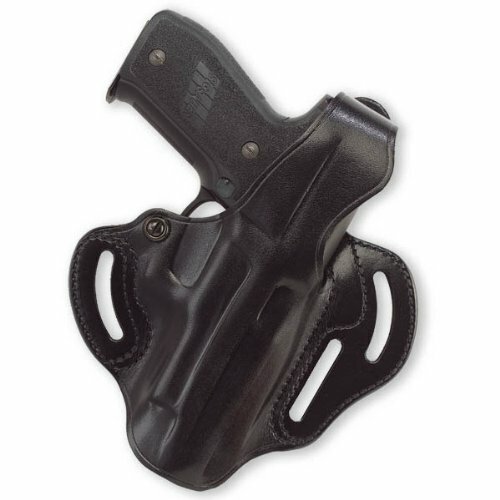 There appears to be little evidence to criticize this Ruger SR9c holster. We looked at 5 great options for the Ruger SR9c, but let us recap each of them to see how they compare to each other. The Fobus paddle product is made from injection molding and plastics and is comfortable to wear. There are issues regarding fit, as it seems to fit the SR9c well initially, but can cause scratches on the muzzle. Also, some users find it difficult to draw the gun from this one, as the retention appears to be too tight. The Desantis Nemesis pocket product is made from a nylon cloth which, on the outside, is ‘sticky’ and makes sure the gun stays in your pocket, and on the inside, is silky, meaning the gun can be drawn quickly and smoothly. It is also a good fit for the SR9c, but there are serious issues with concealing your weapon using this in particular. The Outbags nylon OWB is made from 600 denier nylon and is very comfortable to wear with the webbed spine, which gives a customized fit. Drawing the weapon is smooth and fast and, with the adjustable velcro straps, is a perfect fit for the Ruger SR9c. Only worries seem to be the craftsmanship and the belt clip. The Compact Pro Carry is made from heavy-duty leather and is the perfect fit for the Ruger SR9c, which is to be expected as it is designed for this gun. Drawing your weapon is smooth, after the initial ‘break-in’ period required for all leather products. Comfort is also high, with the only concern being that, as it does not distribute the weight of the gun, wearing this good for an extended period of time may cause discomfort. The Ruger SR9C IWB hybrid is made from high-density leather and Kydex. Comfort is unsurpassed, with the customized fit that Kydex affords. As to be expected from a product designed for the Ruger SR9c, the fit is perfect, and drawing the weapon is also perfect, as a user can adjust the retention to suit them. Which Ruger SR9c Holster Would We Choose? In this case, you get what you pay for, and at almost twice the price for our second-placed option, the Ruger SR9C IWB hybrid holster wins! It cannot be beaten in terms of comfort, fit, draw and craftsmanship. You cannot get a better Ruger SR9c holster, and this will last you a very long time. 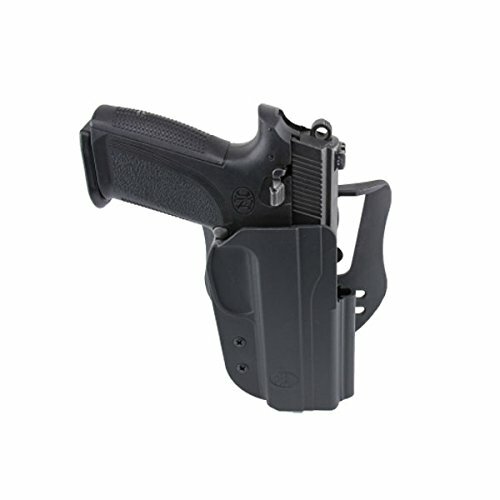 The Compact Pro Carry is our second-placed option at almost half the price of the Ruger SR9C IWB hybrid holster, and is a good alternative if you don’t want to fork out for our first-placed option, but do keep in mind, if you plan on wearing one sheath for long periods, the Compact Pro Carry may cause discomfort. If You Had To Pick A RUGER SR9C HOLSTER, Which One Would You Choose? There are a lot of options out there that are great. We only really looked at 5 of them in depth. If you had to spend money today on a Ruger SR9c holster, which one would you buy and why? 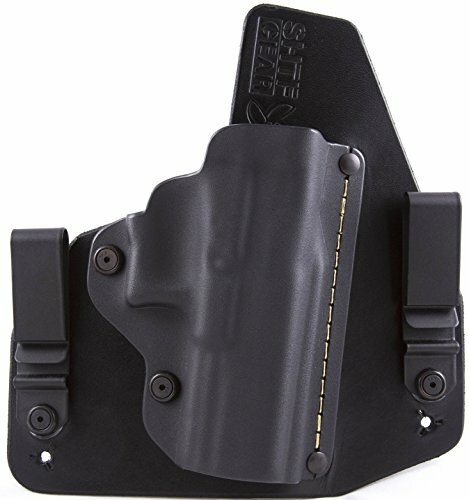 What is a good option for a Ruger SP101 holster? We list 10 great products in the table below that you can consider when shopping for a new one. We also go and take a closer look at 5 of them below in order to pick our favorite. As with all guns, you need to take into consideration your guns functionality, weight, and size when looking for suitable gun cases. The SP101 itself has 6 models with slightly different dimensions. With these dimensions, all the SP101 models can be classed as medium to large guns and, as such, are difficult to use with pocket and ankle cases. For the Ruger SP101 revolvers, the best product would be OWB (over the waistband), IWB (inside the waistband), and shoulder holsters. As the Ruger SP101 is designed to be used for self-defense, your best bet will be IWB and OWBs. OWBs are great if you have no need to conceal your weapon, but for most people, concealment is key. A shoulder case is ideal for concealing the Ruger SP101, but bear in mind that it requires you to wear a coat or jacket at all times for the weapon to be hidden. As well as not being ideal for warmer climates and seasons, wearing a jacket or coat will also slow down the quickness of your draw. On the other hand, an IWB is ideal for comfortable, concealed carry without a jacket, whilst also allowing quick draw when necessary. We listed and compared 10 great options for you in the table above. But let’s look at the top 5 options in a bit more detail. We want to look at overall quality, retention, comfort and affordability/value for money. This is an ambidextrous Ruger SP101 holster option made of a type of viscous black cloth that actually makes your weapon stick to it as if it were fly paper. Desantis say that it would simply never move out of position from your front pocket. The inside lining is made from a slick cloth, which means there is practically no friction when drawing your weapon. Also, the core has foam to break up the outline of the gun. Some users have mentioned, however, that this foam is not enough to conceal the gun well. Other users have tried the belt with various pockets sizes, on various garments from jeans to cargo pants, and still felt the imprint of the gun was very noticeable. Another criticism is that the bottom of the holster is too wide and may not fit all front pockets. The wide one ends up stretching the pocket, causing a more pronounced printing issue. This Ruger SP101 holster could possibly be a good storage option, but may not be ideal for actual wearing. The goods from Fobus are made from space age high density plastics and injection moulding, which are designed for military and law-enforcement forces in mind. The materials that this product is made from results in a durable one that is also low maintenance! If you want to clean it, you can just wipe it down with some water and a bit of soap. No need to break it in first like with leather options. One think you will need to do when you first get the case is to adjust the retention screw to adjust the retention to your liking. Often Fobus products come from the factory with the screw quite tight. Comfort is a feature of this option thanks to the paddle that it comes with. So if you need to carry for a long period of time, that will be a huge factor. This product rides nice and high, and is a good option for concealed carry. Thanks to its molding r, fit and retention for the SP101 is excellent! There have been some complaints about 2 hard plastic studs, which some folks say dig into your side. Some folks also mentioned that the springs on the metal reinforcing clip on the back of the paddle causes some discomfort when they bend over. This Ruger SP101 holster option is made from 600 Denier Nylon and is available for left and right-handed users. 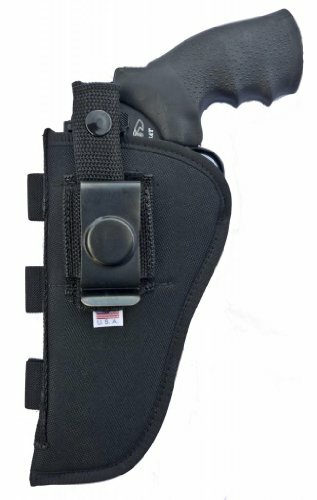 It boasts a fully adjustable thumb break, which the makers say eliminates delay when drawing your gun, a removable steel belt clip so you can mount it onto a belt or waistband, a belt loop which allows you to secure it to a belt permanently, and a webbed spine which allows it to bend into your body and ensure a snug fit that’s personalized to you. Additionally, you also get a magazine pouch. Despite the fact that the makers sell left and right-handed versions, some users have noted that it can be classed as ambidextrous; they simply remove the metal belt clip and switch to the nylon loop on the other side. Also, the thumb straps can be swapped, removed completely or adjusted using the velcro under the nylon loop. The Ruger SP101 holster is also lined with a smooth cloth instead of just nylon. One user felt that this product was very comfortable and he was able to wear it on his hip with a jacket covering it, but he felt it would be difficult to conceal in the summer without a jacket, and was not very comfortable to drive with. One drawback of this Ruger SP101 holster option is that some users have found that it is a little too big for the SP101. One user felt that the product was about 2 inches too long. He managed to get around this by placing a piece of foam at the bottom of it. However, some people may not find this idea appealing, especially as this product does advertise itself as one for the SP101, amongst other guns. 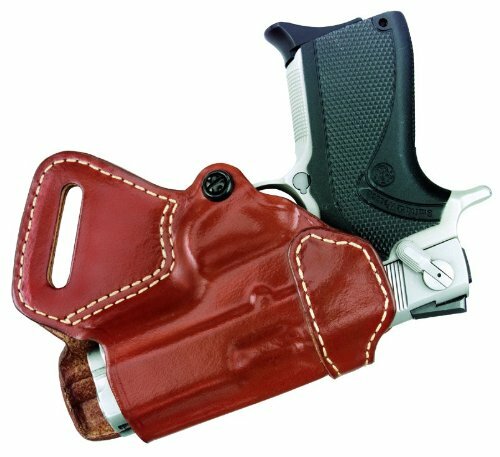 This Ruger SP101 holster option is hand made from premium wet-molded leather and heavy-duty elastic, which results in a discreet design and secure, snug fit. It comes with a trailing belt loop which can help to pull the grip in closer to the body. Blackhawk has styled this product to look similar to the famous Berns-Martin design. This is a quality product, but keep in that a number of users have said that it is far too small for the SP101, with the weapon’s 3 inch barrel being an inch too long for it. Also, the belt loops will only fit a small one-inch belt and nothing larger. Additionally, one user said that, because there was only one belt loop to one side, the product would not sit well on his hip. Unlike a lot of Ruger SP101 holster options which are designed for more than one make of gun, this holster is designed for the SP101 only. It is made from thick, Mexican leather with hard boning, which provides a contoured, precise fit. It also boasts an integral, steel-reinforced thumb snap closure which retains the gun securely, and a 1.75 inch belt slot which is double-stitched and molded to make it easier to get the holster on and off the belt. As with all good leather products, there is some time needed to break the leather in, but once this is achieved, drawing and re-holstering is very smooth. Although this Ruger SP101 holster option rides high, it’s not the ideal holster for concealed carry, unless you wear a thick, long jacket, but it was never designed for this anyway. A quality Ruger SP101 holster option. The Desantis ‘Nemesis’ is made from black cloth and, although fits the SP101 well, is not designed for quick draw. It is comfortable to wear, but there are serious issues regarding concealment, as well as problems with not fitting a lot of front pockets. The Fobus Standard is made from plastic and injection molding, is very durable, and fits the Sp101 very well. However, it seems it requires some work to be able to draw your weapon quickly and smoothly. There are also serious issues regarding comfort, as many users have mentioned that the springs on the reinforcement clip, and the plastic studs, cause pain when wearing it. The Outbags product is made from nylon that is very comfortable to wear, due to it’s the webbed spine, which gives a personalized fit. Draw seems to be quick and simple, but the main drawback here is that the product is a little on the large side, and it may be too large for the smaller SP101 versions. The Blackhawk Leather Speed Classic is a premium product made from wet-molded leather and elastic. Draw is smooth and fast, once the leather has ‘broken in’, which is to expected for any leather product. But there are issues due to the size being too small for some SP101 models. Also, comfort and security are issues, as this one does not sit correctly on the hip for some users. Bianchi Thumbsnap product is made from Mexican leather and draw is quick, as long as the leather is ‘broken in’. 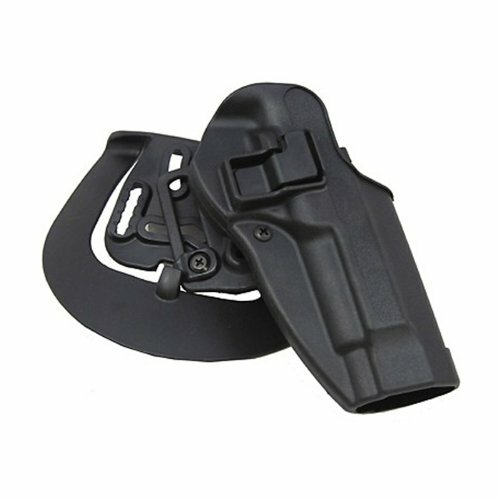 Fit is perfect, as this is the only holster here designed just for Ruger SP101, and it is extremely comfortable to wear. The only drawback we can see is that, unless a long jacket or coat is worn, it is not ideal for concealed carry. Whic Ruger SP101 would we choose? In terms of all the 4 aspects we look for in a Ruger SP101 option, namely quality of materials it is made from, comfort when wearing, fit of the Ruger SP101, and ease of draw, then, without doubt, the Bianchi Thumbsnap holster gets top marks. With quality leather, a design that ensures a perfect fit for the SP101, unbeatable comfort, and a smooth draw, no other one can beat it. The only disadvantage we can find is that it is not designed for concealed carry. For concealment, the Outbags would be a good alternative, but make sure it fits your model of SP101, as it can be a little too big for some of them. 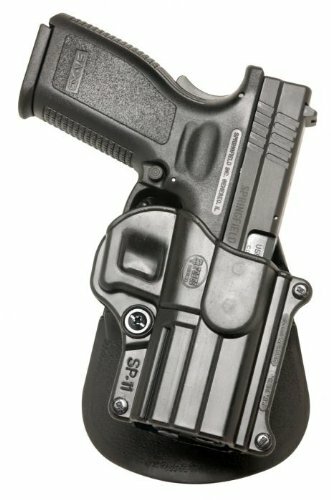 Are There Better Ruger SP101 HOLSTER OPTIONs? Sometimes too many choices can be overwhelming. That is why we decided to look at only 5 products in detail for the Ruger SP101. If you know of any other that would be excellent options for the SP101, please leave us a note in the comments section below to tell us about it. To be able to choose a carrier that fits the Ruger P95 perfectly, we need to be sure of the size of the pistol. Once we know that, we can figure out which one might be options and which options will not. According to the dimensions specified for the Ruger P95, it is a medium sized pistol. Thus concealed carry is not impossible, but open carry might be way to go. Due to the size of the pistol, concealed carry types such as pocket or ankle carriers will not be available for this pistol. Rather, more “traditional” carrier types such OWB or perhaps shoulder products will be relevant. The Ruger P95 is designed for use by law enforcement agencies and the military. But these pistols are pretty popular with civilians too. For self-defence carry, you should choose between OWB or IWB cases. Most civilians who carry the Ruger P95 for self-defense purposes need to conceal their gun, as most US states now prohibit guns being ‘on-show’. Generally, IWBs are more concealable, but due to their bulkiness, there aren’t many IWBs for the P95. It’s best to opt for a good OWB option and make sure you wear a jacket or coat to cover the belt, carrier and gun. You could opt for shoulder picks, but you will find that having to keep a jacket on to conceal the gun will affect how easy and quickly you will be able to draw your weapon. Now that we have a list of 10 selections that would be good choices for the Ruger P95, we want to take a closer look at 5 of them to see how they provide value for money, fit the Ruger P95 and how comfortable they are to wear. 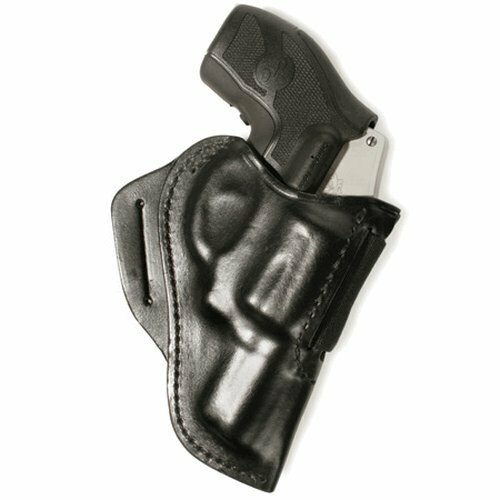 This OWB Ruger P95 holster is made from fully lined black nylon, and comes with an ambidextrous belt and clip combination, which means it can be used by left and right handed people. These are designed to be worn using the clip on the pants, and on a belt using the loop. It also boasts an adjustable thumb break using a steel shank for access, and a compartment for an extra magazine. Regarding fitting the P95, this fits well. Concealability is ok, so long as a long jacket or coat is worn, but the holster is quite bulky. Add to that the bulkiness of the P45, and many users will find they tend to use this on an outdoor range rather than for everyday concealed wear. There is a cover strap for the caarier which makes the gun feel very secure, and makes it ideal for hikes and hunting. Ease of draw is smooth and fast. These OWB Ruger P95 holster options can be found in left and right hand versions and are made of 600 denier nylon. They boast a fully adjustable thumb break and come with a steel belt clip (for mounting onto belt or waistband), a belt loop (for a secure, permanent mount to belt), and a magazine pouch. The most inexpensive option on our list, this sits comfortably on a belt with its webbed spine which molds itself to the user. Additionally, the Velcro straps secure the gun into it and can be repositioned or even removed if necessary. Regarding fitting the P45, this one does fit, but may be slightly loose. However, the Velcro straps do help in keeping your gun in the carrier. Draw is predictably fast as it is a little loose. The nylon is quite thick, which does make the holster a little bulky, and therefore difficult to conceal. Many users prefer to use this one out on the range. However, remember this is a budget option, and therefore some users have reported the stitching coming undone as well as the cheap plastic clip breaking. This is a mid-range OWB Ruger P95 holster for right handed people is made from injection molding and space age high density plastics. This means it is much more durable than nylon options, and is comparable to leather ones, but without the maintenance required to keep leather options in top condition. No wonder then that these are used by a number of the world’s special security and military services. It boasts a protective sight channel, and is extremely light weight. Bearing in mind that the P95 is rather bulky, having a light one really helps. In terms of fit for the P95, this is a fantastic fit, holding the gun securely (you will hear a click when the gun has slotted in correctly) whilst also allowing for fast draw. You do have to practice drawing to get up to a decent speed, but it is achievable. Also, there is an adjustable screw to tighten or loosen the retention, which allows you to get the perfect balance between retention and ease of draw. Regarding comfort, these are extremely comfortable to wear, although will cause discomfort when sitting down as the plastic will dig into your side a lot more than nylon or leather. Concealability is some of the highest you will find for a largish gun such as P95 as these carriers ride high and are rather low profile. Complete concealed carry for the P95 is difficult, but this may be as close as you will get! This budget to mid-range Ruger P95 holster is an OWB type, and made from heavy duty nylon with a smooth inner lining to stop your gun getting scuffed. These come with 2 belt loops and a 2 inch metal clip, and are designed to be work with a belt through the loops and the clip onto the pants. This gives a very secure fit, whilst allowing you to move the belt clip to whichever side feels more comfortable. It boast an adjustable thumb break with a steel shank for easy access, as well as a magazine pouch which can hold double stacked or 2 single stacked magazines. The major draw of these is that they are designed to be used in conjunction with attached lazar lights or flash lights, and fit for the P95 with attached lights is perfect, whilst still allowing for ease of draw. 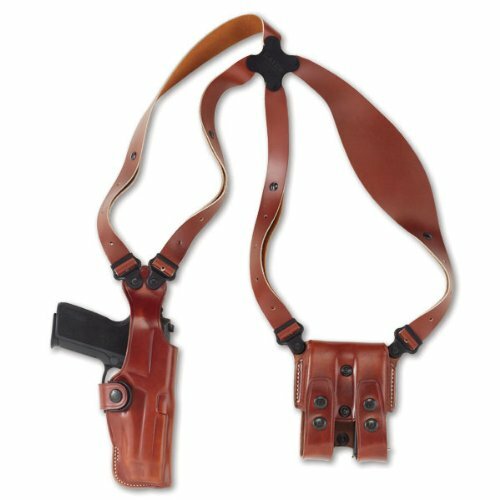 These are comfortable to wear, so long as they are attached to a sturdy belt, and are even more comfortable with a specially designed gun belt. Concealability is almost impossible as it is bulky and is not ‘form fit’. Not a one for concealed carry, but perfect Ruger P95 holster option for on the range practice shooting sessions. These premium, raw cowhide leather OWB Ruger P95 holster are made in left or right hand versions and boast a reinforced thumb break as well as protection for the rear sight with a wide safety strap. There is a tension screw adjustment near the trigger guard which allows you to tighten or loosen the retention until you find the perfect balance between ease of draw and a secure fit. Draw speed is also quickened by the low cut design which allows you to draw you P95 faster and more cleanly. These carriers will fit belts of up to 1 and ¾ inch width. As with all leather selections, your P95 will fell a little too tight in the beginning, as you do need to break it in. Drawing and holstering your weapon many times when you first buy it will help. Also, placing your gun into a zip-lock bag or sock, placing it in it and leaving it all night also stretches the leather. These are probably the most comfortable Ruger P95 holster option of all, which is no mean feat when wearing a Ruger P95! It may appear bulky at first, but give it time to conform to your own body, and you will soon have an option that feels as if it was custom made for you. Concealability is the best you are going to get for a large pistol like the P95, and it shows as these holsters are nearly triple the price of the next most expensive selection on this list. Everyone one is different and has different needs. So to pick a product that is universally recognised to be the best one for the Ruger P95 is impossible. But, we can have a quick look at each again to see how they compare to each other, and from there figure out which one we would choose if we were in the market for a new one. 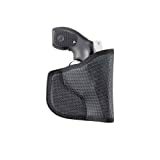 The Ruger P95 holster side option is made from fully lined nylon and is reasonably comfortable to wear. It fits the P95 well and allows you to draw your gun fast. However, this is bulky and you will find it hard to conceal. The OutBags OB-16SC Nylon OWB Belt Gun with Mag Pouch is made from 600 denier nylon and is comfortable to wear, once its webbed spine has had the chance to mould itself to the user. Draw is fast, but it is a little too large for the Ruger P95 (although there are Velcro straps to compensate). Our bulkiest pick on the list, these are impossible to conceal and are ideal for outdoor and on the range use. The Fobus Standard RH Paddle is made from injection molding and space age high density plastics, and is very comfortable when standing up, but may cause issues when sitting down. Draw is fast once you have adjusted retention to your preferred strength, and it is one of the most concealable holsters on the list. The Ruger P95 w/laser is made from heavy duty nylon, and is comfortable so long as it is mounted onto sturdy belt. It provides a good fit for the Ruger P95, so long as you are using it with lazar or flash lights. It offers good speed and ease of draw, but is bulky and designed for on the range use and not concealed carry. The Galco cop 3 slot is made from premium raw cowhide leather. Once you have allowed for the break in period required for all leather option, it is the most comfortable one on our list, is the perfect fit for the Ruger P95 and offers a customized draw speed for each user. Once it has had the chance to mold itself to your body, it also offer the most concealable option on our list too. Which Ruger P95 holster would we choose? The Ruger P95 holster coming in a number one position is, predictably, the most expensive option; the Galco Cop 3 side holster. Once you have given it a little attention, it will love you back by being the most comfortable, customizable one that fits to your body perfectly whilst fitting your Ruger P95 snugly. However, if patience is not your thing, opt for the Fobus Standard. At a third of the price of the Galco cop 3, it offers almost the same concealability and comfort. Remember that Ruger P95 pistols are rather bulky anyway, so many users don’t choose these guns for concealed carry purposes. If you plan on using these guns on the range our for various outdoor pursuits, then once concealability has been taken out of the equation, you may favour other Ruger P95 holster options, especially ones that can carry one or more magazines, such as the Ruger P95 w/laser. WHAT IS THE BEST RUGER P95 HOLSTER OPTION? Now that you have read all the information on the holsters that we have described for the Ruger P95, which one would you choose and why? Or if you have actually owned and used any of the options we talked about, please let us know what you thought about it! When you have a quality gun, you need a quality holster. So to help you find the right one that will get the job done, we put together a list of the 10 top choices available. When choosing a product for your Sig Sauer SP2022, you should remember that the gun that you use and how you use it will determine which option you should get. So before we look at the 5 best options, let us first get to the know the SIG SP2022 a little better. The dimensions for the SIG SP2022 shows that the Sig Sauer SP2022 is in the medium size category of guns. Therefore, although it can be concealed with some imagination when it comes to your wardrobe, it’s not always easy. It can be used in conjunction with a whole host of Sig Sauer SP2022 holster options but, generally, pocket options need to be avoided, as it would be difficult to effectively conceal this pistol. 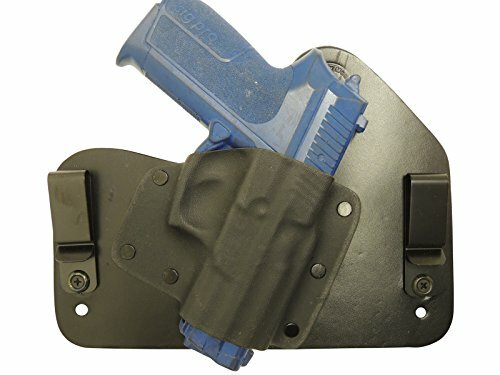 Below we look at 5 Sig Sauer SP2022 holster options that are available on Amazon. We look at the materials that there are made from, the comfort of how it is worn, how it fits the Sig Sauer SP2022 and how easy it is to draw your weapon from it. These Sig Sauer SP2022 holster options are made from an injection moulded polymer, and were designed for the military and special security services. The idea behind them is that leather choices need maintenance (leather needs to breath, can sweat, and may also need lubricants and oils). These are maintenance free (can be cleaned with just some soap and water) and can withstand the severest of elements. Theseproducts are designed for right handed shooters, has a steel reinforced rivet attachment, and attach using a rubberized paddle. They generally ride high, giving a low profile, and also weight under 2 ounces, all of which help with concealability. This fits the Sig Sauer SP2022 with rail perfectly, but there have been some grumbles with the tension as it can be a little cumbersome to adjust, and some users worry about how well their pistol would be retained. Some users have commented that it is better to adjust the tension whilst wearing the holster, as the tension can feel very different if you adjust it when it’s not on your body. We would have preferred it to have a retention release, for ease of draw. Crucially, it covers the pistol trigger guard, which is essential when the Sig Sauer SP2022 does not have a manual safety. The cant is slightly forward, which will suit a lot of users, but we would have liked the cant to be adjustable. The paddle part is made of stiff leather, which makes it very robust, but can make it difficult to conceal. Despite the stiffness, the paddle is comfortable, but be aware that there is protruding metal at the top of the paddle that can rub against you. Wearing the paddle inside the waistband may cause some discomfort. Wearing it outside the waistband would be more comfortable, although you may find it rubs and damages your trousers. 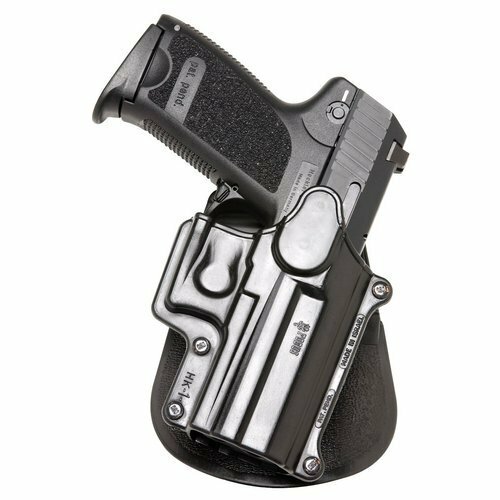 This Sig Sauer SP2022 holster, designed for right headed shooters, is made from durable polymer and has been created for the armed forced, military and law enforcement agencies. The real selling point is the secure dual safety retention mechanism. These are 2 locking points which hold your pistol very securely into the carrier. Draw is smooth, as the combination thumb and finger press are placed in the ideal positions for you to release in one motion. This does take a little practice, and you might find that draw is slow at first, but very soon you will be able to draw with no drag or snagging. It fits the Sig Sauer SP2022 snugly and the polymer has been contoured to give a great, comfortable fit. Cant is also fully adjustable and can rotate 360 degrees for complete customization. Another major advantage it the ability to attach other accessories, such as belt loops, belt clips, or thigh rigs. This can be achieved simply with the use of an Allen key. This selection rides low, so can be concealability is good, although it does require a little imagination with your wardrobe. A good, versatile Sig Sauer SP2022 holster. If you just want a straight forward product that is affordable, then this pick from Outbags is an option you can look at. It is made from 600 denier nylon, so it is durable yet light. It also has a soft Tri-Cot inner lining to protect your gun from scratches when you contain it. It has the basic steel belt clip so that you can attach it to your waistband or belt. If you are a lefty, you are in luck as this option suits both left hand and right-hand users. Because it is on the lower scale of price, it is not the best quality you would get in product. Some folks have complained about the stitching of the option not being the best. There are also some complaints about the steel belt clip being much too stiff. That makes it really difficult to put it on your belt or take it off. There are also cases where some folks say the belt clip bends out of shape. If you have to carry your weapon for long periods of time, be aware that the hard shell of the product will probably be uncomfortable against your body. This is an inside the waistband Sig Sauer SP2022 choice made from a mixture of premium leather and Kydex, and designed specifically for the Sig Sauer SP 2022. As to be expected when a product is created for one particular pistol in mind, fit is absolutely perfect. Naturally, the pistol may appear a little too big at first as this is a leather option. Allow for a break in period (try covering your pistol with a sock, place inside the carriers, and leave overnight), but once broken in, you will have a product that has the perfect balance between retention and smooth draw. The manufacturers, Everyday Holsters, are very confident about their products, as they offer a lifetime guarantee, as well as giving you a 2 week trial period – if you’re not completely happy, send back for a full refund, no questions asked. These Sig Sauer SP2022 carriers are extremely comfortable to wear and conceal the Sig Sauer SP 2022 incredibly well, considering these are not the smallest of pistols. Yes, you will still need to think about your wardrobe choices, but you would be silly to think you could wear just a thin t-shirt and shorts and effectively conceal a weapon of this size. Cant is adjustable although you may need to reposition the belt clips a number of times for you to get your perfect position. This option will not be perfect for you ‘out of the box’, but with some time and patience, you will have a ppersonalizedSig Sauer SP2022 holster that will last you many years. 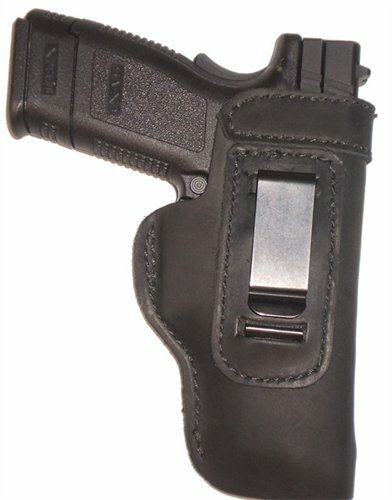 This is our most expensive Sig Sauer SP2022 holster on our list, and has been designed with the Sig Sauer SP2022 in mind. As such, fit for this pistol is unsurpassed. It comes in both left and right hand versions to suit all shooters. It’s made from premium full grain cowhide and is an over the waistband option. With all leather choices, you need to allow for a break in period, so this may seem a little stiff at first, and a little too small for the SP2022. However, once broken in, drawing your pistol is very smooth – simply sweep the middle finger over the release lever and draw the pistol out and upwards (Bianchi call this the FingerLok retention mechanism). This also has an additional advantage as no one can sneak up from behind you and pull out your pistol. Despite the ease of draw, the SP2022 feels secure in the carrier and will not budge until you draw, due to the auto retention feature. The design is ‘open muzzle’, which means it is very easy to reholster your pistol with one hand. Carry angle is at a 15 degree cant, and it will fit belts up to 1.75 inches with dual belt slots so the carrier and pistol can be pulled very close to your body for excellent concealability. Comfort is fantastic, as there is practically no rubbing on the skin (which tends to be a standard issue with paddle style selections). The only slight grumble we could find about this Sig Sauer SP2022 holster is that the slot to place the belt is too wide. You end up having to skip one belt loop, but this is a minor issue. The Fobus Standard is made from injection moulded polymer, and is very lightweight, making it comfortable to wear, although there are issues with rubbing when worn inside the waistband. Concealability is an issue as the paddle is rather stiff and can print through clothes. Draw is fast and smooth. However, there are issues with retention of the pistol. The Level-3 Retention Gun is made from durable polymer, and has excellent retention, due to the due to 2 point locking system. It rides low and is reasonably concealable. Draw is smooth, but needs practice. But the adjustable cant, which can rotate a full 360 degrees, does allow you to set the product in the perfect position for you to draw. This option is also reasonably comfortable to wear. The OutBags OB-16S Nylon Inside Waist Band Conceal Carry Gun is a no frills affordable choice. It is made from 600 denier nylon, which makes it light yet durable. Concealability and draw is decent for this one, but keep in mind that this holster was designed to be able to fit a wide variety of pistols. It is not the best quality option, but is a good one that you can use without feeling bad if it gets some damage. 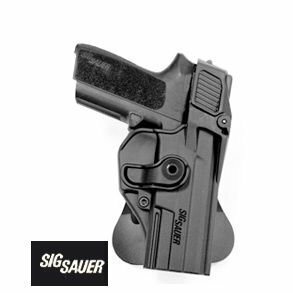 The Everyday Holsters Sig Sauer Sig Pro 2022 Hybrid is made from premium leather and Kydex, and fit and draw are perfect, due to this being designed specifically for the Sig SP 2022, and having an adjustable cant. Naturally, it will feel a bit too small for this pistol at first because of the leather, but once broken in, it is a perfect fit. Concealability is fantastic, considering the Sig Sauer SP2022 is not the smallest of guns, and the carrier is very comfortable to wear. The Bianchi 82 Carrylok Hip is our most expensive one on our list, and is made from premium cowhide. As it is designed for the Sig Sauer SP2022, fit and draw are perfect, after the initial break in period. It is also exceptionally comfortable to wear, and extremely concealable, due to the dual belt slots which pull this close to the body. Which Sig Sauer SP2022 holster would we choose? Normally you get what you pay for, and the Bianchi 82 Carrylok Hip should, by all rights, win this battle. The only fault we could find were the too-wide slots for the belt. But we were really won over with the Everyday Holsters Sig Sauer Sig Pro 2022 Hybrid Holster! At almost half the price of the Bianchi 82, it performed just as well. We would recommend you paying the extra money for the Bianchi 82 if you really want the Carrylok feature, which means no one can sneak up behind you and unholster your pistol, and you prefer over the waistband options. Otherwise, go for the Everyday Holsters Sig Pro Hybrid , as it delivers everything the Bianchi 82 does, as well as an adjustable cant, and is inside the waistband – at almost half the cost – a winner! WHAT DO YOU THINK ABOUT THE Sig Sauer SP2022 HOLSTER OPTIONS? We hope that you found this article helpful in finding the right product for your needs. But if you have used any of the selections above before, we would love to know what you thought of it. Was it any good? When you are shopping for something like a carrier, where different folks have different needs, you need options! So we put a list together that shows you the top 10 options to consider. If you are in the market for a carrier for your SIG P229, just be sure to keep in mind what you will need from it. Whether it needs to be concealable or really comfortable. Before we start looking at options, let us first have a closer look at the SIG P229 as a pistol. You can see from the dimensions of the pistol that the SIG P229 is in the medium size category of guns. Therefore, it is an option for concealed carry if you carry it with the right type of clothing. It can be used in conjunction with a whole host of SIG P229 holster options, from ankle, shoulder, over the waistband (OWB) and inside the waistband (IWB) choices. Below you will find a detailed review of five options suited to the SIG P229. We look at the fit of it for the P229, if the price is appropriate and how well suited it is to concealed carry. This SIG P229 holster is famous for its active retention system. It does away with thumb breaks which can make re-holstering difficult and slows down your draw. Instead, it has a SERPA Technology lock which, when you carry the weapon, automatically engages the trigger guard and will hang onto it until you release it. You release it by simply using your normal drawing motion and using the trigger finger to push the mechanism beside the body of the carrier as you draw. Your trigger finger should naturally fall on the lock release mechanism. However, some users have reported that the thumb push off area is a little on the small side and you need to wiggle the gun to release it from the container, just like a new leather product, and that it actually follows the gun upwards as you draw. Also, it is a little bulky, so may not be ideal for concealed carry. It comes with both the paddle platform and belt loop, and there are swivel buckles on the belt loop, which allow articulation for maximum flexibility. Keep in mind that this option is designed for the SIG 220 / 226, which are slightly bigger guns compared to the SIG P229. This means that the SIG P229 does fit into it, but is a little loose. However, because of the SERPA lock, your SIG P229 will feel secure. A few users have noted that, with the belt loops, it is difficult to attach and remove a duty belt. Also, some users have mentioned that it scratched their pistol. 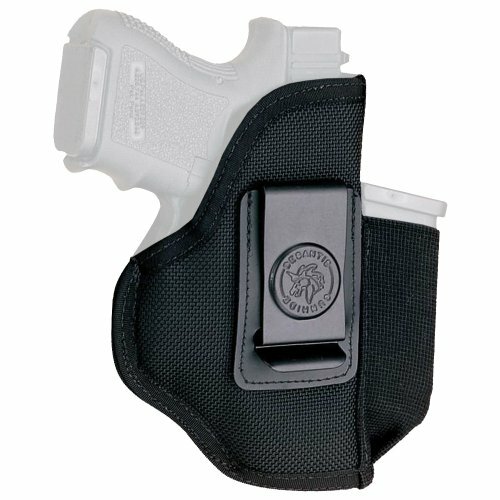 This SIG P229 holster is made from premium ballistic nylon and is ambidextrous. It also has a powder coated black spring clip (for left handers, it can be removed and inserted on the opposite side) which will hold this one securely on your belt. It comes with an extra magazine clip. This SIG P229 holster is an inside the pants option. Some users have mentioned that this product does sit a little low on the waist band, making it difficult to conceal with some garments. A good upgrade would be a version that sits just a little higher which would give you a better draw grip. The star is the black spring clip, which many users say is solid and holds it very securely on the belt, even if it may be a little stiff when swapping the clip from side to side. This SIG P229 holster is made from top grain tanned leather and, despite the fact that it is created not only for the SIG P229, but for the P225 and P228, it fits the SIG P229 like a glove. The belt loop slots are quite large, so make sure you wear this with a thick enough belt. If you wear a belt that’s too thin, the carrier will ride up, and there will not be enough tension against the belt for a clean draw. With a thick enough belt, draw is smooth and fast. Naturally, as with all leather products, the pistol will feel a little too tight, and draw will be slow. Allow for a break in period, and practice drawing and reholstering your weapon until you get it to the perfect size. Thumb break is also a little stiff at first, but within a few days (and with use) will loosen up. You can also choose between holding the gun straight up or tilted forward, depending on draw preference. And the deep definition molding means that this SIG P229 holster moulds itself to you in time, creating a very concealable choice. This is almost identical to the Gould & Goodrich pancake SIG P229 holster above, but is a small of the back choice. Made from the same leather, it is as comfortable and concealable as the former. It will fit belts from ½ to 1 inch and there is also an adjustable tension screw. We do have a small grumble with the fixed belt loops, as you need to remove your belt to remove it. We would have preferred snap loops. Again, as it is made of leather, draw will be difficult in the beginning, but after the carrier has been broken in, draw is smooth, and the adjustable tension will help you create just the right amount of tension between pistol retention and smooth draw. 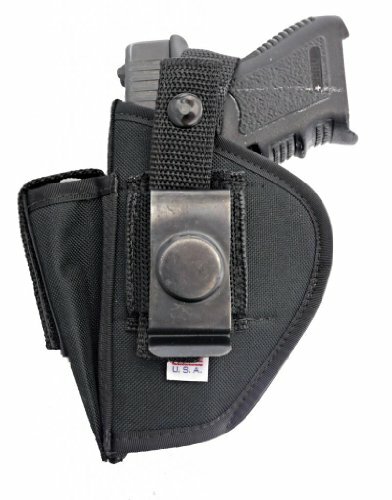 This SIG P229 holster does pull your pants slightly at the small of the bank, and your shirt will get stuck on the container when you sit down and your shirt rides up. Despite trying different shirt lengths, this problem persists. You also may need to wear high-waisted slacks for this product to work which, although easily done, are not exactly high fashion. If you’re a fan of small of the back selections, this choice is perfect, as it fits the SIG P229 like a glove and is very concealable, so long as you wear the right slacks and belt. If you want to carry concealed, then this product might be a good option for you to consider. While it is an over the waistband option, it is a lot more concealable than standard pancake choices. It is made from a two-piece construction, where the side closest to the body shapes itself to the contour of your hip, and the molded piece being on the other side. This makes for a narrow design, helping concealability and comfort. One person who has used this holster commented that this is the only holster that he can wear reasonably comfortably while driving! Because it is a hand molded pick, retention for the SIG P229 is great. If you want to draw your weapon quickly and easily, the combat grip design makes that possible. It also has a covered trigger guard for safety. As you would expect from a leather product in this price bracket, quality is quite good thanks to the double stitched seems. You can choose it in either left or right hand configuration, and you can choose between black and havana brown colors. Remember that as this is a leather product you will have to break it in first when you get it. You can see our guide for breaking in a leather option here. How Do The SIG P229 HOLSTER Options Compare? So which one is the best choice as a SIG P229 holster? Let us recap and compare them against each other. The BlackHawk choice is made from carbon fiber, and is comfortable to wear. The SERPA lock is a winner when it comes to retention as, even though the SIG P229 is a little too small for the carrier, it is retained well. Draw is good, but keep in mind that the SERPA lock release takes some getting used. It’s also rather bulky and will easily print through clothes. The DeSantis Pro Stealth holster is made from premium ballistic nylon and another good fit for the SIG P229. It sits rather low, so can be difficult to conceal, but is comfortable when worn. The main drawback with this selection is the long break-in period when it comes to the container releasing the gun smoothly. It may be a while before you achieve a smooth and fast draw. The Gould & Goodrich B803-229 Gold Line Three Slot Pancake is made from top grain tanned leather, and draw is smooth after the initial break in period. Fit for the SIG P229 is perfect and this holster is very comfortable, as well as very concealable. The Gould & Goodrich 806-26R Gold Line Small Of Back is identical to the above pancake choice. Draw is smooth, although some people find drawing from the small of the back to be slower in general. Extremely concealable, and there is no discomfort, although this can pull on your pants waistband. The Galco Concealable Belt choice is made from quality saddle leather. Because it is a leather product, you will need to break it in first when you get it, to make sure your weapon fits well into it. Overall this is a really comfortable option to wear and is hard to beat! You can do concealed carry with this it, though it is not perfect for concealed carry. The Galco Concealable Belt is by far the most expensive one on our list (more than twice the price of the next most expensive selection), and with it being a perfect for the SIG P229, it would make sense to think ‘you get what you pay for’. And you do! This is a great SIG P229 holster. But we were blown away with how well the Gould & Goodrich B803-229 Gold Line Three Slot Pancake performed, matching the Galco in every aspect, and doing it at less than half the price. 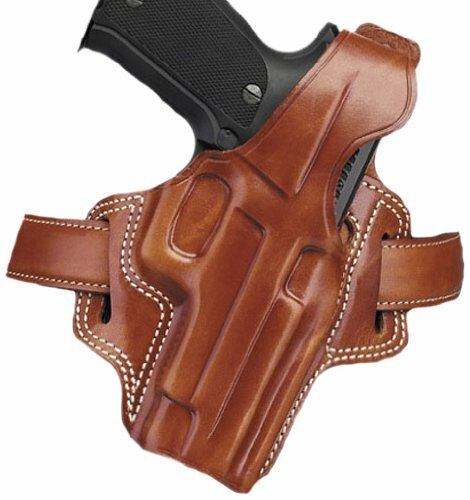 So our top SIG P229 holster is the Gould & Goodrich Pancake Holster, and for anyone who prefers small of the back choices, we wholeheartedly recommend the Gould & Goodrich 806-26R Gold Line Small Of Back, as the only reason this didn’t come number one is because we simply prefer carriers to the side instead of at the back. Who says you have to always pay top dollar for quality? IF YOU HAD TO PICK A SIG P229 HOLSTER, WHICH ONE WOULD YOU PICK? What do you think of the SIG P229 holster options we covered? Do you believe there are better options to fit the P229? Or have you perhaps used any of the products that we have described above? If you have, please tell us about it! We would love to hear from you. What is the best FNX9 holster out there? That, of course, depends on you, in terms of what your needs are and your specific tastes. So to help you choose the one that best suits your needs, we created a list of at least 10 awesome picks that you can look at for your FNX9 holster. From the above dimensions, you can see that the FNX 9 can be classed as a medium to large size pistol. This makes it more difficult to conceal in general, and would be completely unsuitable for ankle or pocket. Instead, you should look at shoulder cases, over the waistband (OWB), and inside the waistband (IWB) products. The FNX 9 is manufactured for law enforcement agencies and civilians concerned with self-defense. In the civilian market, the need to conceal your weapon is usually important. As these pistols are quite large compared to some others on the market, concealment can be difficult. Most civilians who carry the FNX 9 would ideally like to be able to conceal their gun. In that case, an IWB carrier is likely to be the better option, although OWH will also work, so long as you adjust what you wear to suit. Shoulder carriers are a good option for concealed carry, if you live in colder climates where wearing a jacket all the time is common. But in warmer seasons or climates, concealing your weapon may become uncomfortable, and a jacket will also hamper the ease of draw and draw speed. Below we look at 5 FNX 9 carriers that are available on Amazon. We look at the materials that the products are made from, the comfort of how it is worn, how it fits the FNX 9, how easy it is to conceal, and how easy it is to draw your weapon from it. This OWB FNX 9 holster is designed to have no thumb breaks, but still gives you full pistol retention. This is done through precise molding of the leather, as well as a tension screw device. As it is designed for the FNX 9 and FNX 40, the fit is perfect, although, as should be expected with all leather carriers, a decent ‘break in’ period is required until you are completely happy with draw. This is a comfortable selection to wear that doesn’t ride up or dig into your ribs when you sit down. It conceals well and does not print a ‘bump’ on your hip. It can fit belts up to 1 and 3/4 inches wide. The only minor gripe is that the adjustment screw has a tendency to back out. This can be remedied by adding some Teflon tape onto the screw to hold it in place. This is a straight drop, OWB, plastic molded FNX 9 holster, with a paddle attachment and sting ray belt attachment. Retention is helped with the Positive Lock Trigger Guard, which are two retention screws that allow you to fine tune your draw until it is just perfect for you. Fit for the FNX 9 is excellent, once you have the retention right. It is very light and comfortable to wear and is one of our budget options. It’s difficult to find anything wrong with this FNX 9 holster, and the only issue would be that this is an OWB, and therefore, in general, more difficult to conceal. This IWB FNX 9 holster is made from double stitched leather. Fit is perfect as it is designed with the FNX in mind, and it clips in securely and comfortably onto the waistband using a sturdy metal clip. Concealment is good, if not a little on the bulky side, but can be concealed with some imaginative clothing. Some users have had issues with reholstering their gun. As it is made of leather, you do need to allow the leather to break in. Try leaving your pistol in the case for a couple of days. Some users find this can be helped further by first putting your pistol into a sock or plastic bag, and then stuffing it into the holster. There is no option to cant the weapon, so either the position works for you or it doesn’t. Also, the back of the pistol slide may rub against you as the last inch of the weapon is uncovered. Still, for our most inexpensive selection on the list, this is a good FNX 9 holster. 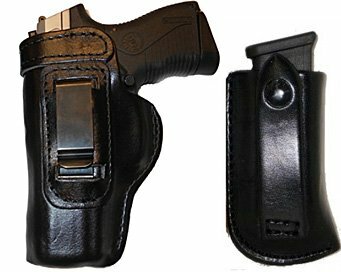 This OWB FNX 9 holster is made from American Leather and also includes a handy magazine carrier. It comes with a gun blued spring steel clips, which have hidden leather grabbing prongs. This will not allow your belt clip to move or lose retention, and will hold the it in place when your draw your weapon. The makers include break in instructions with this one and recommend waxed paper. The workmanship on this option is second-to-none, using top grain leather, bonded UV polyester thread, which is mold resistant, whilst it also enables a number of different carry options to suit different users. A versatile FNX 9 holster that will definitely stand the test of time. The makers also claim to use an exclusive molding process when manufacturing these carriers, and this does give it the perfect fit when used with the FNX 9 pistol, with exceptional retention and fast draw, once you have allowed for the break in period. Concealment is great for an OWB pick, but as to be expected with any OWBs, you cannot wear this with certain clothing and expect good concealment. This top-of-the-range IWB FNX9 holster is made from a hybrid of quality leather and Kydex, a type of moldable plastic. It boasts the ‘Comfort Curve’ which is made from Kydex and creates a curve in the back of it that is molded by each user, ensuring a very specific fit. This makes this an incredibly comfortable selection, whilst also bringing the grip close to the body to help with concealment. What’s more, this FNX 9 holster offers adjustable retention, adjustable carry height and cant to suit every user, durable Kevlar stitching, beveled edges, and a sweat guard cut, so you get a full shooting grip on your pistol when it is holstered. This means you are ready for action, even in unpredictable situations. Despite the leather being quite thick, it molds to your sides so well, along with the Kydex comfort curve, that it’s very difficult for anyone to know that you are carrying a weapon. Comfort is also unsurpassed. The Desantis Speed Scabbard is made from leather and is a great fit for the FNX 9. Draw is great, once you have allowed for a good break in period, and you have adjusted the adjustment screw till it is just right for you. Comfort is also good, and this FNX 9 holster is quite concealable, considering it is an OWB. There are issues however with the adjustment screw staying in place. The FNH 9/40 Blade Tech Revolution OWB is made from molded plastic and gives good retention once the two retention screws have been adjusted to your liking, Draw for the FNX 9 is also good, it is comfortable to wear, and gives decent concealment, given that it is an OWB. The FN FNP FNX FNS 9 40 Leather Gun is made from leather, with a good fit for the FNX 9 pistol. There are issues with concealment, as this is quote a bulky option. Drawing your pistol is fine, but reholstering can be difficult. Also, there are issues with the back of the pistol scratching you. Add to that the inability to adjust the cant, and this does have some minus points. However, this is our most inexpensive selection, at only a third of the price of our most expensive carriers. So, for the price, it’s still a very good option. The Gun H. FN FNP FNX FNS 9 40 Pro Carry HD /w Magazine Carrier is made from top grain leather, and gives the perfect too, due to the manufacturers’ exclusive molding process. This process also makes draw and retention incredibly smooth, as well as making this FNX 9 holster very comfortable to wear. Concealment is also fantastic, bearing in mind it is an OWB, so you will need to adjust your clothing. The FN FNX 9/40 IWB Hybrid with Adjustable Retention and Comfort Curve is the top-of-the-range on our list, and it shows. Unsurpassed comfort and concealment, and made from top quality leather and Kydex, cant and height is also adjustable to suit each and every user, draw and retention is unbeatable, and it fits the FNX 9 like a glove. Well, no one here will be surprised to hear that we award first place to the IWB Hybrid Holster! The most expensive one on the list, but we doubt you would find another option that can beat this. It will also last the test of time, and should fit every user out there. A very close second, however, goes to The Gun Pro Carry, and the sad thing is, we couldn’t fault it. The only reason it came second is because OWB carriers do limit you when it comes to what you can wear, much more so than an IWB. But this is hardly the manufacturers’ fault, when they are selling this as an OWB product in the first place. If your preference is for OWB selections, then you can’t go wrong with these FNX 9 options. WHAT DO YOU THINK – WHAT IS THE BEST FNX 9 HOLSTER OPTION? What do you think of the FNX 9 holster options we covered? Do you think there are better selections for the FNX 9 out there that we did not list? If so, send us a message and tell us what product you think is the ultimate FNX 9 holster! We hope you find the best FNX 9 holster for your needs! If you have any thoughts on the topic of FNX 9 holster options, we would love to hear it. So please, share your thoughts with us in the comments section! Disclaimer: www.smokingbarrelusa.com does not manufacture, sell or distribute any of the products described above. All information is based on descriptions provided for the product by the relevant sellers’ product page for the product on Amazon.com. When looking your Ruger SR40 holster, you need to keep in mind how you plan to carry and use the weapon. Do you want to carry concealed? Are you going to have to carry the weapon for lonf periods of time? Is it likely that you might need to draw your weapon very quickly in a self-defence situation? How you plan to use your weapon will determine largely what product you pick for your SR40. So let’s start by looking at the SR40 as a pistol. Looking at the dimensions of the SR40, we can see that the Ruger SR40 would fall into the medium size category of guns. So perhaps not ideal for concealed carry, although also not impossible to carry it concealed if you wanted to. Even though it and can be used in conjunction with a whole host of Ruger SR40 holster options, pocket options generally need to be avoided as it would be difficult to conceal this pistol. We do a deep dive review of 5 of the top options below. 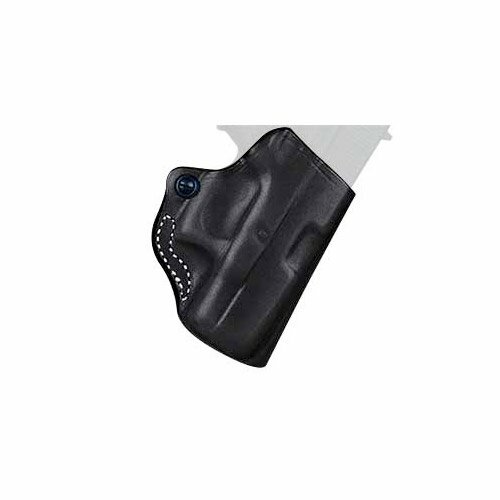 This Ruger SR40 holster, made from Cordura nylon with a waterproof closed-cell foam padding and nylon lining, comes in left and right hand versions, and is an over the waistband. It comes with a belt clip which allows you to clip this onto a belt (belts can be 1.5 inches to 1.75 inches wide). The makers claim that this is the strongest belt clip in the industry, which does give a very steady product. The real advantage is that you can wear it anywhere; strongside, crossdraw or small of the back. It also features an adjustable thumb break and an added magazine pouch. There are some issues with this Ruger SR40 holster, as we had to keep adjusting the Velcro to keep the pistol snug. In general, it is a little too big for Ruger SR40. It’s also a little difficult to remove the pistol using one hand. This will slow down draw. 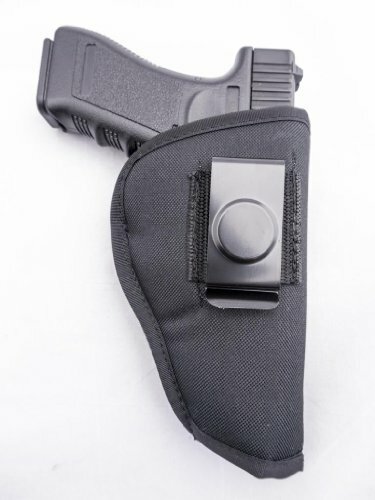 The clip, although very sturdy, does not support the holster fully, so it can wobble on the belt, and the carrier can even changes position on the belt if you are running. Concealability is OK, and the magazine pouch is a nice touch, but we would have preferred it to be removable to make it less bulky. This Ruger SR40 holster is made from 600 Denier Nylon and comes in left hand and right hand draw versions. 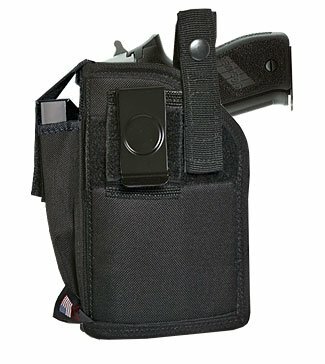 It has a fully adjustable thumb break, steel belt clip, belt loop and a standard magazine pouch. The thumb break helps keep your pistol secure whilst also adding to a smooth and fast draw. The steel belt clip is removable for mounting onto a belt of waist band. The belt loop can give a more secure and permanent mount to the belt. It fits the Ruger SR40 well. This Ruger SR40 holster was designed to fit snug against the body, and boasts a webbed spine that helps to shape itself to an individual user. Some users, however, have noted that the Velcro causes them problems when moving the carrier. Also, the metal clip steel belt clip is not very sturdy, and one user claimed the clip ripped the stitches from the case when he was attempting to clip it onto the belt. Another issue is that it seems to cover the top inch of the pistol, where you have the front of the grip. This means that the gun cannot be griped until it has been removed from it. Therefore, this product seems ideal for firearm retention or when you at a range, but would not be ideal for quick draw situations, such as in self-defense. This is a right handed, paddle-style Ruger SR40 holster made from mold-injected of polymer with a rubberized paddle. It’s very lightweight, weighing merely 2 ounces, and boasts a steel reinforced rivet attachment and a protective sight channel. The USP of this is that it was designed for anyone who wants to accommodate a handgun that utilizes rail or trigger guard mounted accessories, such as lights or lasers. Retention is very good, due to the muzzle stud and safety strap that circles the trigger guard. At the same time, draw is fast due to the open withdrawal slot at the rear and the design of the safety strap. This product fits the Ruger SR40 nicely, although may be a little too tight at first. Draw and reholster your pistol a number of times over the first few days to loosen it up. Cant is not adjustable, so those who prefer an ‘FBI cant’ will be disappointed, and drawing from the back instead of the top takes some getting used to. Still, considering there are so few options for the Ruger SR40 when you use it with accessories, this is a great option. A keenly priced Ruger SR40 holster made from Cordura nylon that boasts a suede-like exterior, which helps anchor the carrier to inside of pants. There is also 4 layers of nylon, yet the material is no thicker than conventional suede holsters. The extra layers act as an internal moisture barrier so no perspiration gets to the gun. As with the OWB version above, the real draw with these options is the ability to position it small of the back, crossdraw or strongside. The belt is very sturdy (apparently the strongest clip on the market) and clips onto belts securely. There are major concerns about retention with this Ruger SR40 holster. Some users have said that it feels like it will spill out its contents unless you concentrate on keeping the carrier vertical – not practical. The suede-like material does make for a comfortable option, though, and it is more concealable than the OWB version. Draw is fast due to the reinforcement of the front sight. This is budget priced option, so naturally workmanship is not of the highest quality, and stitching can come undone over time. Another Nylon based version, this option has a soft Tri-Cot inner lining, which is great to prevent any scratches on your gun (sometimes the metal/hard parts inside a holster can scratch a weapon when you carry it). It is a versatile option in the sense that is available for both left handed and right handed folks. It also has a steel belt clip so that you can securely attach it to your belt if you wanted to. If you do want to carry your SR40 concealed, this one is not the worst choice. Due to its slim design, it does not leave much of a print. There are concerns over the durability of this selection though. Some folks who have used it have complained about the quality of the stitching of the holster. Another area of issue is the steel clip, which seems to be very stiff. That makes it very hard to take it off your waistband or belt. The clip can apparently also bend out of shape easily…which is not ideal. If you need to carry concealed and you need to carry your weapon for a long period of time, this might be a problem for you. The stiff outer shell can rub against your body, which can become very uncomfortable. Unless of course you wear something between you and the carrier. Overall your Ruger SR40 should fit reasonably well into this choice. But you need to remember that his product is designed to be able to fit a wide variety of pistols, so it will not be glove-like fit for your Ruger SR40. Overall, this is not the best option if you plan to carry your SR40 for a long period of time, or want a really well made choice that will last you a long time. Rather, this is probably better suited to being used to carry your weapon to the range. The Barsony Gun OWB Belt is made from Cordura nylon. It is rather bulky and difficult to conceal, due to the non-removable magazine pouch. However, it is comfortable to wear. It’s also not a great fit for the Ruger SR40, and the Velcro strap needs adjusting to keep the pistol snug. Draw is slow as you cannot draw with one hand. The OutBags OB-16SC Nylon is one of the more affordable choices on our list. It is a no frills product, which is better suited to just using it to carry your weapon to the range or the occasional outing. The webbed spine does allow it to be worn comfortably, but it is probably not the best option if you plan on carrying concealed. Also, if you need to be able to draw your weapon really quickly, you should perhaps consider some of the other options on this list. The Fobus Black paddle Right Hand RH Gun is made from mold-injected polymer, and is lightweight and comfortable to wear. It fits the Ruger SR40 snugly, although a little too tight at first. Draw is good, although drawing from back will take some practice. It’s also reasonably concealable, although bear in mind, this is designed for those using accessories, such as sights, which makes the whole kit more bulky in general. Another Nylon option from Outbags on our list, the OutBags OB-16S Nylon is also an affordable product. Quality is not the best, which can be expected from one product in this price range. If you want a cheap option that you can use and abuse without feeling bad, this is a good choice. However if you want a product that is comfortable and will last a long time, I would recommend looking at one of the other selections. We found it difficult to choose an outright winner here, and it shows that there is not much choice when it comes to options for the Ruger SR40. Top place goes to the Fobus Black paddle Right Hand RH Gun Holster. Although not very concealable, it allows you to use your Ruger SR40 with accessories, and is a great fit. In this instance, with it being nearly double the price of all the other selections, you really do get what you pay for. WHAT DO YOU THINK OF THE Ruger SR40 HOLSTER OPTIONs? If you want to find a great selection for your SR40, there are a lot of options out there. What carriers have you used for your Ruger SR40 before, and what did you think of it? Have you tried any of the selections we mentioned above? If you have, please share your thoughts with us in the comments section below! The Ruger LC9 is a great gun, but what case types are appropriate for it? To be able to answer that question we should first understand how big the gun is and we want to carry it. That will allow us to figure out which one would fit the Ruger LC9 well. It is apparent that the Ruger LC9 can is a small to medium sized pistol. Because of its small size and weight, when looking for a Ruger LC9 holster a user can choose from a full range of products; from pocket options, over the waistband (OWB), ankle, shoulder and inside the waistband (IWB) products. The Ruger LC9 has been manufactured specifically for discreet carry by US citizens concerned with self-defense, although it has become a favourite ‘backup gun’ for off-duty law enforcement officers as well. Concealment is high on the agenda for most civilians, especially now where the law in most US states require a gun carrier to keep their weapon concealed at all times. Since these pistols are quite small, concealment is easy and can be accomplished with most types of gun carrier. Ankle carriers are particularly popular for small guns. Keep in mind though; speed of draw is hampered as you need to bend down to get your pistol. When it comes to ease of draw, opt for pocket, OWB holsters IWB carriers. After we have figured out which cases types would be appropriate for the Ruger LC9, we can have a closer look at 5 great options. 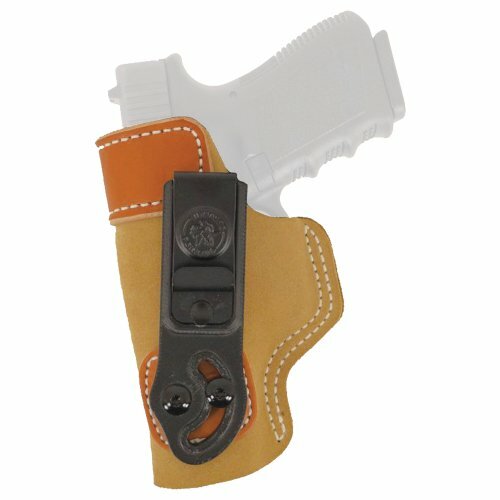 This OWB Ruger LC9 holster is made from 600 denier nylon, and boasts a fully adjustable thumb break which allows you to draw your gun fast whilst keeping it secure, a removable belt clip for mounting to a belt or waistband, as well as a belt loop for a more secure and permanent mount to belt. There is also a handy magazine pouch so you can carry an extra magazine, and this comes in left and right hand versions. This is a budget Ruger LC9 holster (the cheapest on our list) and yet there are many aspects to laud it for. The Velcro retention strap is adjustable for length and angle, as well as whether it falls on the grip or the striker/hammer. The thumb snap can also be moved from the side to the top. In addition, this features the Outbags ‘Webbed Spine’ which allows each to shape itself to its user, creating a comfortable, personalized fit. For such an inexpensive pick, Outbags have done well when it comes to making this customizable to each user. Regarding fitting the Ruger LC9, it’s a little on the big side as this has been designed to fit a number of other pistols (such as the Ruger SR9c (which is a little longer and wider), but the Velcro strap makes up for this by holding the Ruger LC9 securely in the case. Drawing the weapon is also simple and fast. The main drawbacks to this Ruger LC9 holster option are concealability. OWBs are usually less concealable then IWBs anyway, but this option is very visible on the hip and would take quite a heavy jacket to conceal. This would be an ideal one for hiking or out on the range. Also, there are worries about workmanship, with many users claiming that the stitching comes undone rather easily, as well as the thumb snap becoming loose after repeated use. However, this is to be expected for such a budget option and, as it’s fairly inexpensive, it is easily replaceable. 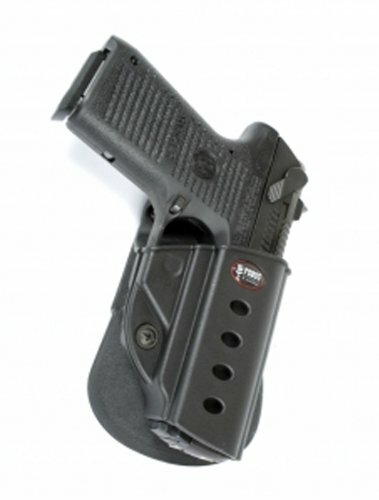 This is a pocket Ruger LC9 holster and, as such, can be used by left and right-hand users alike. It is made from a sticky rubberized fabric on the outside, which essentially allows it to stick to the lining of a pocket. On the other hand, the inside is made from a slick pack cloth, which means your pistol can be drawn out with practically zero friction. All of this allows you to draw your weapon fast, whilst making sure the carrier stays put inside your pockets and does not come out with the weapon (in a self-defense situation, you do not want to spend vital seconds removing a holster from the end of your gun). 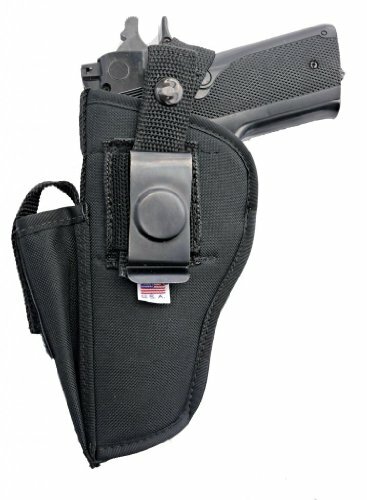 An extra feature on this pocket Ruger LC9 holster is a removable and reversible outer flap. Although this does add further bulk to the case (and therefore will make your pocket look bulkier) this flap effectively disguises the pocket carrier so it looks like a large wallet. So even if it ‘prints’ through your clothing, it does not look like a gun, but a wallet. Regarding fit, this pick fits the Ruger LC9 like a glove and many users have said this one is extremely comfortable to wear. The main drawback is that practice is needed when drawing your weapon. Some users have reported that the sticky outside layer is ‘too good’ with users finding their pockets are turned inside out when drawing their pistol. Some users have also said that it fits the LC9 so snugly that there is too much tension when drawing. However, in general, this is a fantastic mid-priced Ruger LC9 holster that really does conceal your pistol very effectively, and many users choose this pocket carrier as their everyday´s choice. Another selling point is that this can be used as a clip on as well as a belt loop carrier. It can be clipped to the left or the right making it ambidextrous. Having one case that can simply be clipped on is extremely convenient as it can be removed very quickly and does not involve taking off your belt. Also, it boasts a reinforced thumb break that is actually positioned across the hammer instead of the grip, which allows for a very natural feel when drawing. Add to that the built-in magazine pouch and the makers of this option have really gone out of their way to ensure it fits a lot of user’s requirements. Fit for the Ruger LC9 is perfect and this one is very comfortable to wear, with many users stating that they can barely feel it, even when worn all day. There are concerns with the thumb break strap, however, as it is attached using Velcro instead of being stitched on. Now, the makers had to do this as the thumb break needs the ability to be adjusted so it can be used by left and ride hand users, but some users have felt that the makers should have simply designed a left-hand version and a right-hand version which would have meant that these carriers have a much more secure sewn-in thumb break. Also, the metal clip causes concern as it seems to slide out of place and some users have even found the case falls to the ground when drawing their gun. This is not ideal in a self-defense situation as this can be a fatal distraction. Again, this clip is designed to be moved to either the left or right-hand side in keeping with the ambidextrous nature of this product, and it may have been a better idea for the makers to simply create a left and right-hand version with clips that remain on one side and holds it more securely. Concealability and comfort are fantastic, as the inner foam not only conceals the shape of the pistol, but makes the gun very comfortable to have against your body. Draw is fast and smooth, apart from the distraction of possibly having your case fall to the ground when clipped on. This can be avoided by not using the clip and using the belt loops for a more permanent mount to belt. This IWB option is made from tan leather and no-slip suede, and comes in right and left hand versions. It is not actually designed for the Ruger LC9, but was made for the Kahr PM9/40 or the Keltec P11. Despite this, it fits the Ruger LC9 perfectly, and many LC9 owners rate this product. One of the key features of this Ruger LC9 holster option is that it has an adjustable cant, which allows for lots of versatility to get it exactly where you want it so it suits different clothing combinations. It can be worn strong side, cross side as well as in the small of your back. There is no thumb break which means lightning-fast draw, without compromising safety as the belt tension creates enough retention to keep your pistol in the holster securely. It sits low on the waistband and rides very close to the body, making this one of the most concealable holsters on our list, with most users stating the even just a shorts and t-shirt combination is enough to conceal, perfect for hot seasons and climates. The only criticism for this Ruger LC9 holster option is that the leather band around the top of it is a bit thick and can add about half an inch to your hips, depending on your chosen cant. Despite this, it is still incredibly concealable. Another thing is that this product does require you to use a belt with it. Despite the fact that it comes with a clip, it cannot be clipped directly to the waistband. Having said that though, the makers do not claim that this one should be clipped to waistband directly so this cannot be seen as a criticism. 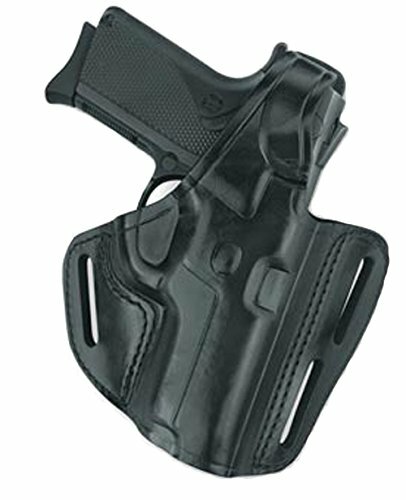 This is an OWB Ruger LC9 holster that is designed purely for the Ruger LC9. As it is made from leather, the LC9 may appear a little too big for it at first, but all leather carrier need time to relax and form itself to the gun it is holding. We recommend putting your pistol into a zip-lock bag or sock, putting it in the case and leaving it in there for a day or two to allow the leather to stretch. Also, practicing drawing and holstering will also stretch the leather and create just the right amount of tension that will keep the pistol securely in it, whilst not becoming detrimental to draw speed. There is also an adjustment screw to help you get the right balance. The main draw of this Ruger LC9 holster is that it has been designed to be as small as possible, which makes it extremely comfortable as wear, as well as no ‘extra’ material that covers the gun, which allows you to have a secure grip. It can accommodate belt sizes of up to 1 and a ½ inches. 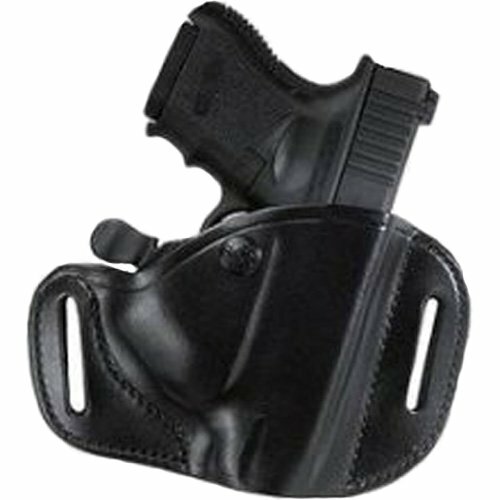 The small size also makes this holster very concealable, and there is minimal printing through clothes. The only drawback is that this holster is about half an inch longer than the barrel of the LC9, which is because it is designed to be used with Lasermax. Keep this in mind, if you don’t want to use Lasermax. This does not really compromise concealability, however. This is our most expensive Ruger LC9 holster on this list. After looking at the 5 options in more detail, we should compare them to each other to determine which option would be the best choice. The Desantis Superfly is made from rubberized fabric and slick pack cloth, and is very comfort bale to wear as it simply slips into a pocket. Unless you have very large pockets, this one is not concealable in the sense that you can’t see it at all. But bear in mind, concealability does not always have to come in the form of ‘invisible’. Disguising a product so it looks like something else (in this case, a wallet) can be a very effective form of concealment, and this is exactly what this belt does. It fits the LC9 perfectly. However, there have been reports of the pocket lining being turned inside out when drawing, which can be an unwelcome distraction in self-defense situations, although actual draw is very fast due to the slick lining. 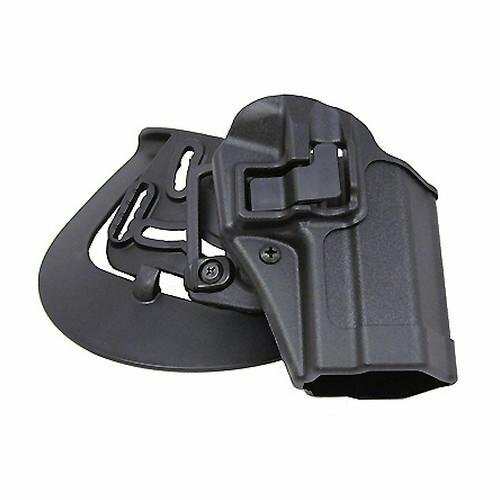 The Ruger LC9 Hip holster with Magazine Pouch is made from nylon, and as it is designed purely for the LC9, it is a perfect fit. It is very comfortable to wear, and the unique aspect of having the thumb break across the hammer instead of the grip makes for a fast and natural draw. It’s a shame that the makers simply did not create left and right hand versions and went for the ambidextrous option, as there are real concerns when using this carrier with the clip. It can fall clean off onto the ground, a possibly fatal distraction in self-defeself-defensens. This can be avoided by mounting to belt using the belt loops. The DeSantis Kahr/Taurus/Keltec Sof-Tuck is made from tan leather and suede, and is possibly the most comfortable selection on this list. Despite not even being designed for the LC9, it is a perfect fit and offerthe s lightning fast draw. The only slight criticism is that the leather band across the top could have been designed to be thinner, but it still remains one of the most concealable holsters on our list. The Desantis Mini Scabbard for Ruger LC9 Gun with Lasermax is made from leather, and is extremely comfortable and concealable due to being such a paired down carrier. Draw is fast, once you have allowed some time for the leather to stretch. As it has been designed specifically for the LC9, it is a perfect fit, so long as you are using Lasermax. Please keep this in mind as this is slightly too big when used without Lasermax. Normally, you get what you pay for. However, we were quite surprised here as our most expensive Ruger LC9 holster option (the Desantis Mini Scabbard for Ruger LC9 Gun with Lasermax) has been beaten to second place by a case that is less than half of its price! Our number one position goes to the fantastic DeSantis Kahr/Taurus/Keltec Sof-Tuck Holster. The comfort and concealability is unsurpassed, with many users simply wearing a t-shirt and shorts to conceal their pistol. Yes, you do need a belt, but we’ve already seen how other Ruger LC9 holster options on this list that boast the ‘no need for a belt, just use our clip’ option have serious concerns regarding the product staying put. For once, saving some money and getting a more budget option is actually the smartest option. Beretta 92FS Holster – Top 10 Holsters For Your Beretta 92FS! 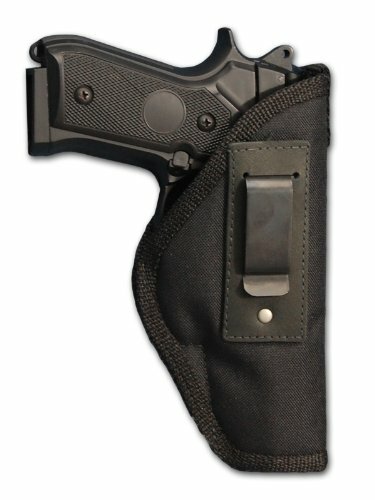 Looking for a holster that fits your Beretta 92FS? You are in luck, because we compiled a list of the top holsters for the 92FS! The table below shows our 10 favorites, while later on in the article we describe 5 of them in detail to be able to pick our favorite. To be able to choose the right sheath for your Beretta 92FS, we need to know how big the gun is and what type might be an option for us. So let’s have a quick look at the key measurements of the Beretta 92FS. The Beretta 92FS is on the larger side of the scale, according to the measurements listed for it. Due to its size, concealed carry will be difficult with this gun. Ankle holsters are definitely not going to be an option! over the waistband (OWB) and perhaps even shoulder belt will likely be your most common option for the Beretta 92FS. Shoulder sheaths are a good option for concealed carry, if you live in colder climates where wearing a jacket all the time is common. But in warmer seasons or climates, concealing your weapon may become uncomfortable, and a jacket also will hamper the ease of draw and draw speed. We listed 10 options for the Beretta 92FS at the top of this article, but we want to have a much more detailed look at some of the best options available for the Beretta 92FS. So below we do a deep-dive of 5. This is an IWB Beretta 92FS holster made from a hybrid of premium leather and Kydex, a thermoplastic. This is incredibly comfortable, which is rare for guns of this size. This keeps the gun tight to your body and is therefore quite easy to conceal, again, normally quite difficult for guns of the size. 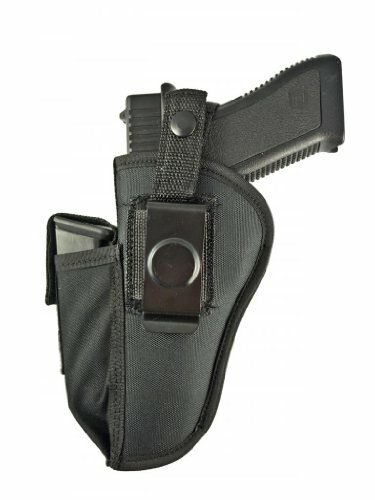 The Kydex helps the sheath to fit snugly into your side, and creates a customised fit over time. Another great feature is that you can adjust the ride height and cant, so you can determine the angle the gun is held at. This means you can make sure the gun is within easy reach. For the price, this Beretta 92FS holster seems to work as well as, if not better, than some higher priced options, and surpasses them for comfort, with one user saying that it was comfortable even in muggy and hot weather. The only small concern is that some of the leather edges may be a little sharp at first, which may cause some rubbing issues, but this is nothing that can’t be solved with some trimming. This Beretta 92FS holster is made from suede and injection molded plastics. The paddle design means that it rides close to the body with a slightly forward cant. It’s main selling point is the ALS (automatic locking system) which locks the pistol into place when it is holstered, keeping it securely in place and eliminating worries about the gun falling out. Removing the gun is done by deactivating the lock with the thumb at the same time as gripping the gun. This results in a fast draw, no seconds are lost deactivating the lock as the lever is positioned in the natural place your thumb would come to rest when gripping your pistol. It comes with a belt loop that fits belts from 1.5 to 1.75 inches in width. The suede lining, additionally, protects the gun from scuffs and marks. A great fit for your pistol, this Beretta 92FS holster’s only real concern is that, with the paddle, it is not very concealable, as canting is only done from the belt and not on the paddle. 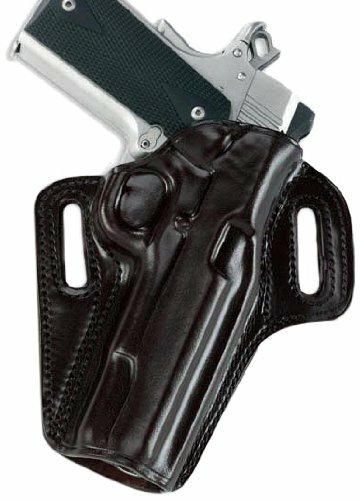 This inexpensive, OWB Beretta 92FS holster is made from 600 denier Nylon and comes with a magazine pouch. It features a fully adjustable thumb break which eliminates delay when drawing, a steel belt clip for clipping onto belts or waistband, and a belt loop for a permanent mount to the belt. The standard Outbags webbed spine feature is also evident here, creating a snug, personalised fit to the user. A very good fit for the Beretta 92FS, it holds the gun securely, but it comes free when you need to draw, with just a flick of the thumb. The main concerns for this one is in it’s craftsmanship, which seems to be an issue with all Outbags holsters. The belt clip is stiff and is difficult to get onto the belt and off again. Also, the material holding the belt clip to the Beretta 92FS holster is easily worn away, and there are issues with seams unravelling. Most users tend to not bother with the belt clip, and use the belt loop. 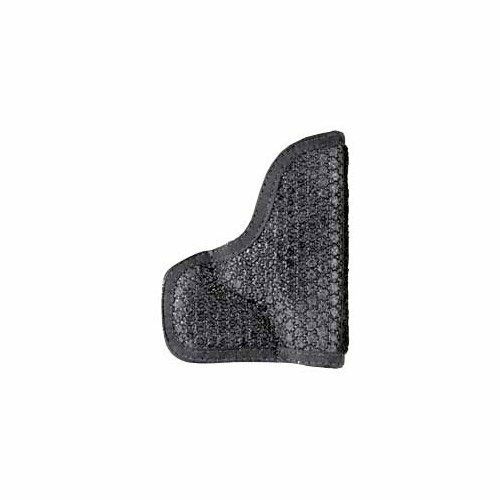 This Beretta 92FS holster is made from carbon fiber and, as to be expected, is extremely study and durable. 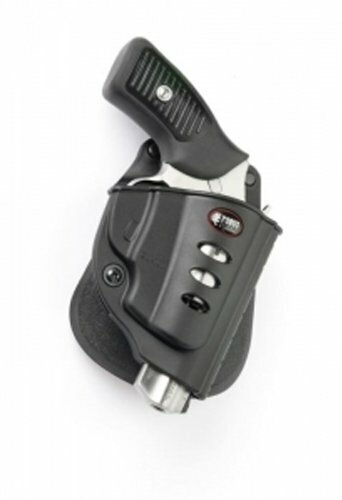 It features the patented SERPA Technology lock, which is featured in a number of Blackhawk holsters. This lock eliminates the need for a thumb break, which speeds up your draw. Essentially the lock engages the trigger guard as you contain your pistol and locks the gun into place. It will retain the gun until you release it. To release the gun from the lock, all you have to do is remove the gun as you would normally and, as this Beretta 92FS holster is designed so that your trigger finger naturally falls on the lock release mechnaism, you can unlock and draw at the same time. It comes with a belt loop and paddle platform, depending on preference. Also, the belt loops have swivel buckles which allow for greater flexibility. This all makes the Beretta 92FS holster very comfortable to use as it can be adapted to each users’ preferences. The only concern seems to be when sitting down. As it is made from durable carbon fiber, it is harder than most holsters, and may dig into the sides when sat down, causing pain. You will also need to tighten the screws from time to time to keep it snug enough for your gun. 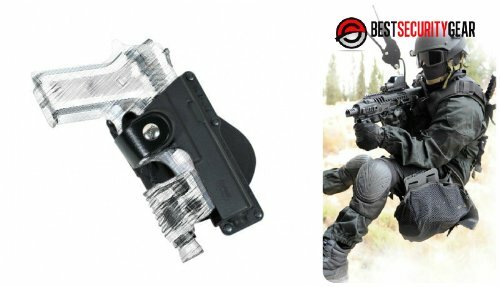 Our most expensive Beretta 92FS holster on the list, this holster is the US military’s standard issue. It’s designed to handle any climate and any condition, which is to be expected when you realise the different environments that the armed forces have to operate in. Apart from exceptional durability, this has the ability to have extra add-on modular accessories, making it ideal for the military. This is ideal for anyone who likes going camping, hiking hunting etc. It also fits the Beretta 92FS perfectly, and protects the weapon from all elements. This Beretta 92FS holster, however, is not designed for drawing speed or for concealed carry, so it becomes difficult for civilian use, apart from when partaking in activities such as hunting, hiking etc. We have done a detailed review of the 5 holsters, but how do they really compare to each other on an individual level? The Everyday Holsters Beretta is made from Kydex and premium leather. Comfort when wearing this one is second to none, and it is the perfect fit for the 92FS. Drawing the gun from this is extremely smooth, and concealing the weapon is easy, despite the Beretta 92FS holster being a larger gun. 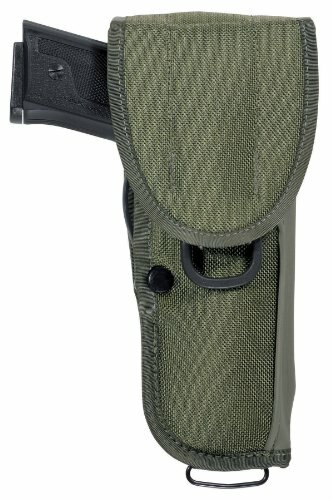 The Safariland Beretta ALS Concealment Paddle holster is made from injection molded plastics and suede, and, due to the automatic lock system feature, draw is fast and smooth. It is also a perfect fit for the Beretta 92FS, and is very comfortable to wear. The only concern is that, despite it’s name, it can be difficult to conceal, with the paddle being rather bulky. The Outbags OB-19SC OWB Belt Gun is made from 600 denier nylon. It is comfortable to wear thanks to its webbed spine feature, which gives a customised fit to the user. It fits the Beretta 92FS very well, and draw is smooth with the fully adjustable thumb break. 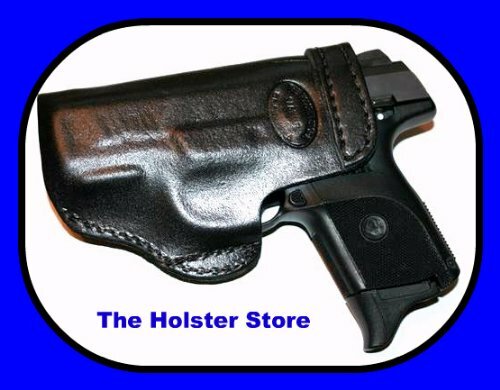 As with most inexpensive holsters, there are concerns regarding durability, with issues with seams unravelling and damage caused by the belt clip. The BlackHawk CQC is made from carbon fiber and is therefore very durable. The elimination of the thumb break because of the patented SERPA technology lock means lighting fast draw, whilst also fitting the Beretta 92FS perfectly. The main concern is that, due to it’s carbon fiber construction, this may be uncomfortable when sat down. You may need to consider when you would be carrying your weapon. If it’s mainly when standing up and walking, then this one will cause no discomfort. But if you expect to sit down, this may well dig into your sides. The Bianchi M12 Comercial is, without doubt, the most durable and reliable of all the holsters. Incredibly well made, and able to withstand all the elements, it will stay faithfully by your side no matter what you are doing, and never cause you any discomfort. However, as to be expected, draw is not fast because of the protective flap, and it is simply not designed for concealed use. Bearing in mind that the military don’t need to conceal weapons, and their need to have a one that will keep up with all the demanding environments that military personnel find themselves in, we can see why this design is so loved by the US Forces. But for civilian use, the problems with concealing the weapon, and the inability to draw your weapon fast and smoothly are major issues. So which Beretta 92FS holster option would we choose? Making it to first place in our Beretta 92FS holster options list, is the Everyday Holsters Beretta holster! We are amazed at how this one can conceal such a large gun as the Beretta 92FS so well, and at the same time be so comfortable to wear. Although the Bianic M12 Comercial is the most expensive and most durable option on the list, the fact that is not designed for general civilian use has meant that it could not be our number one Beretta 92FS holster. Unless you find yourself needing to have a gun with you in rough environments, the Everyday Holsters Beretta is durable enough for normal use, and also gives unbeatable concealment and a fast, smooth draw. WHAT DO YOU THINK – Which one IS THE TOP BERETTA 92FS HOLSTER? We really hope this article has helped you find one for your Beretta 92FS. From looking at the holsters we described, which option would you pay money for? If you have used or owned any of the holsters we have described, do let us know what you thought of it.